Those of us who have volunteered to test recipes for Norm's book have received our first recipes. We have been asked to not share the recipes, naturally, but Stan has told me it's okay to post photos. It's a bit of a tease, I know, but, from another perspective, it's publicity for a much-anticipated project of two esteemed TFL members. For those other recipe testers willing to share their own results, I propose using this topic to collect photos of your breads/pastries/cookies in one place. 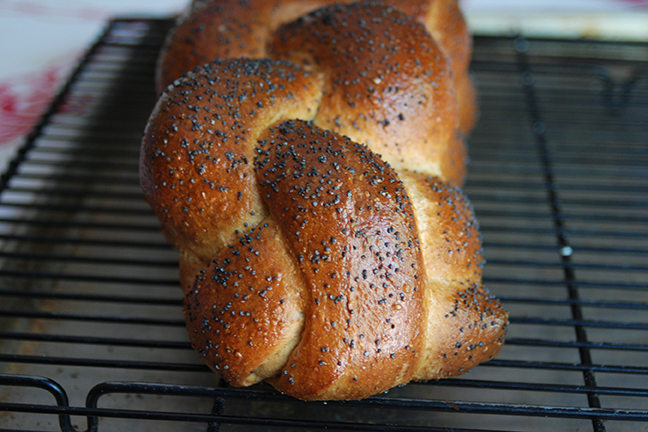 My first recipe was for "Bakery Pan Challah." It is sinfully delicious fresh baked and as toast this morning, with butter and cherry-plum jam. I'm betting it will make fabulous French toast tomorrow morning, as well. Makes feel better baking hamburger and hot dog bun on a beautiful Saturday morning in paradise!! There is always the next loaf, boule, batard, or baguette to go onto! I'll follow suit with my test of the Honey WW Challah. It was "outrageous good" according to my teenage daughter. My wife, who doesn't care for challah generally, pronounced this one's flavor as "magnificent." We're going to run out of superlatives before Norm runs out of recipes, I fear. How many braids is this? 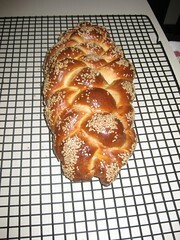 I did the 6 braid challah (photo below). This was my first Challah (see the last post). I did pinch both ends, but they didn't hold. Do you tuck the ends under to get that more finished look? I almost would not have cared if it was good or not, I'd want one just to look at! Beautiful job! 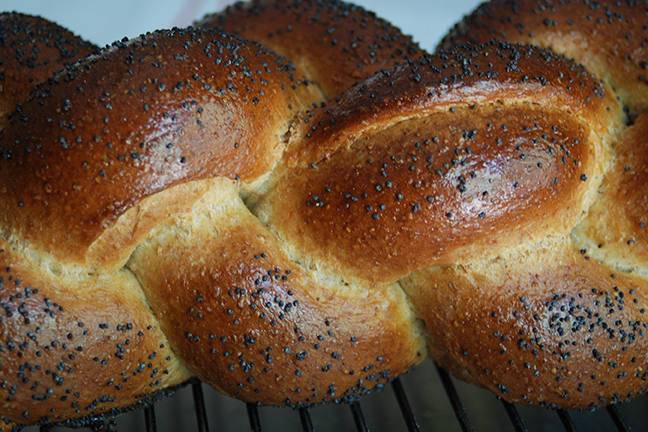 Another Gorgeous Challah...and the photos speak for themselves! Here is my loaf pan challah. Here is my loaf pan challah. I omitted the poppyseeds. Nice job, ryeaskrye! The buns looks delicious. I see the struggle with my weight coming on! Mmmm! Here's my half eaten Hungarian Walnut Roll, it was really excellent. I am in serious trouble! Looks awesome. 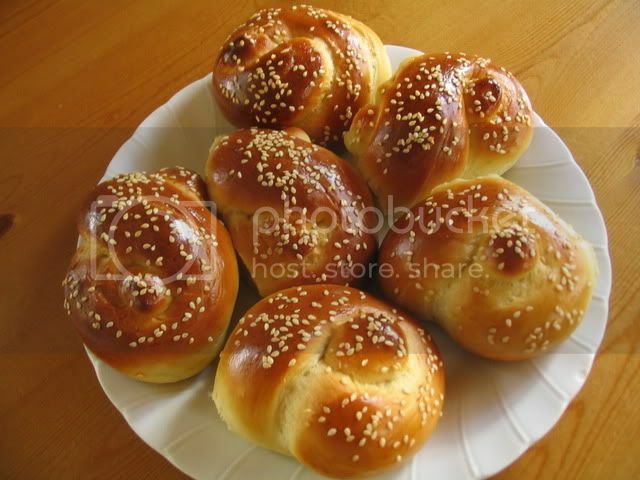 These Hungarian Walnut Rolls are scrumptious!!! I did use butter instead of shortening. In Croatia, they call these Orehnjaca ( pronounced: OrechnyAcha). it's super traditional in middle Europe. 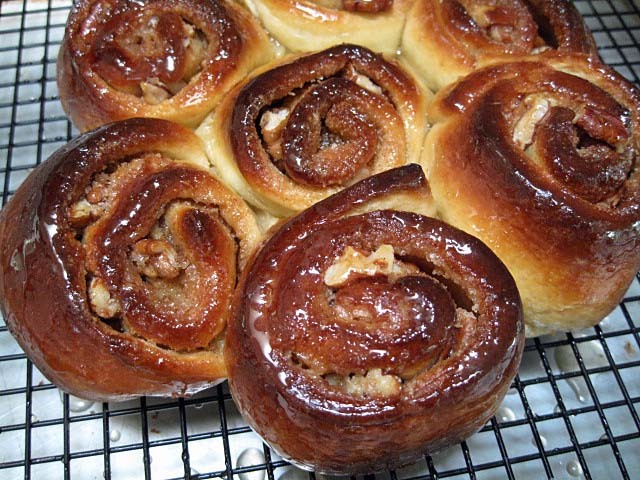 Would you share the recipe for the dough on your Hungarian walnut rolls? I want to make some of them for Christmas and have lost my mother's old recipe years and years ago (she passed away in 2001). I can remember how to make the walnut filling and the poppyseed filling but cannot recall the proportions for the dough itself. The recipes in this topic were being tested for a new book which we are told will be released next Spring. The recipe testers have pledged to not make the recipes public. When the book is available, you can be sure it will be conspicuously announced on TFL. David is correct. these were test recipes for an upcoming book. We testers are sworn to secrecy. Official handshake and everything. However, you could always send Norm and Stan a PM and see if they might be willing to help. This is killing me. It's obvious that the recipes being tested for the NY Jewish Bakers book are going to be terrific. Each one of the posted test bakes are beautiful. I can hardly wait for the next batch. Wow-when is the book coming out? This looks like a must have set of recipes. 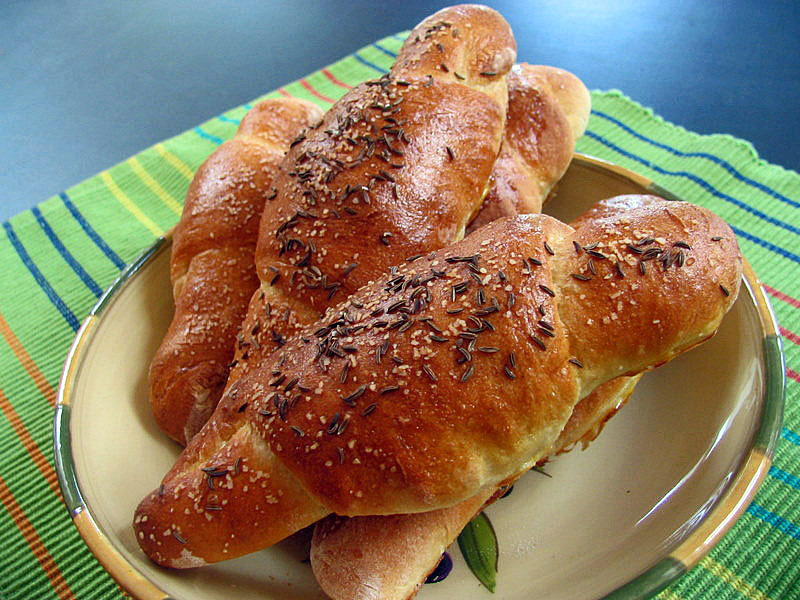 I've only tried his Onion Rolls but these pics are mouth-watering! I can't wait! For the new book once it's published.... everything looks fabulous!! 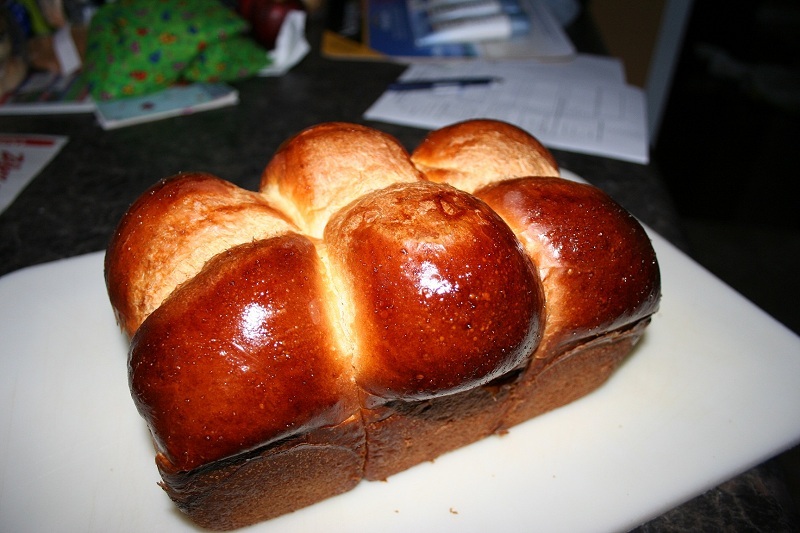 I like the idea of the challah loaf in the pan, bet that would make the best french toast ever. Good call, Franchiello! I had some of the challah as French toast this morning. It was, indeed, "the best french toast ever." BTW, my family always made French toast with challah. We ate it with powdered sugar and sour cream, never with syrup. I suspected this choice was derived from how we ate cheese blintzes - with jam and sour cream. Here was my attempt. Cant wait for the next one. This challah is beautiful! Can you please give me instructions for braiding like this? How many strands is it? I appreciate it! 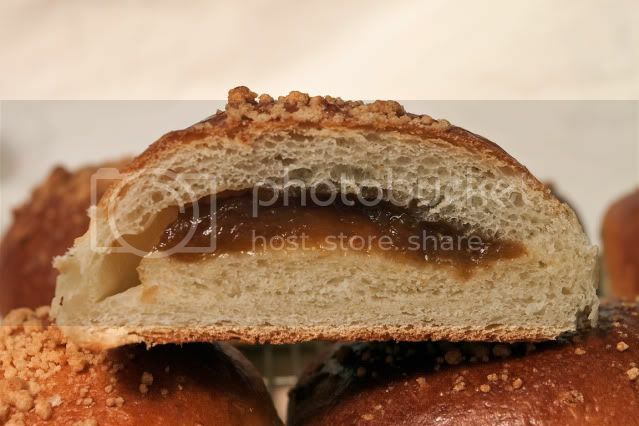 If it will make my breads look like these pictures, sign me up for an advance copy!! 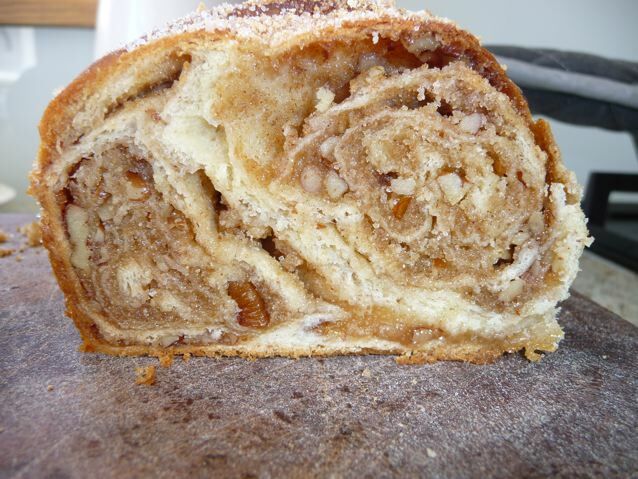 I'm not usually a pastry eater or baker, but enjoyed the Hungarian Walnut Roll. So did our next-door neighbors, who said they had to eat multiple pieces each just to make sure that it really was as delicious as it seemed. It was. Your hamantashen look perfect, Mini! The filling is easy and very good! Thanks, I have never seen them before. Thank goodness half of them are not in the picture. Even raised my pune filling critic the eye brow! Passed the Austrian MIL test too! Better than Powidel! Just too tasty! ...I'll take the low road! haha - oh well, at least they tasted good! And I'd better keep on joggin' right down that low road until I work off that butter! 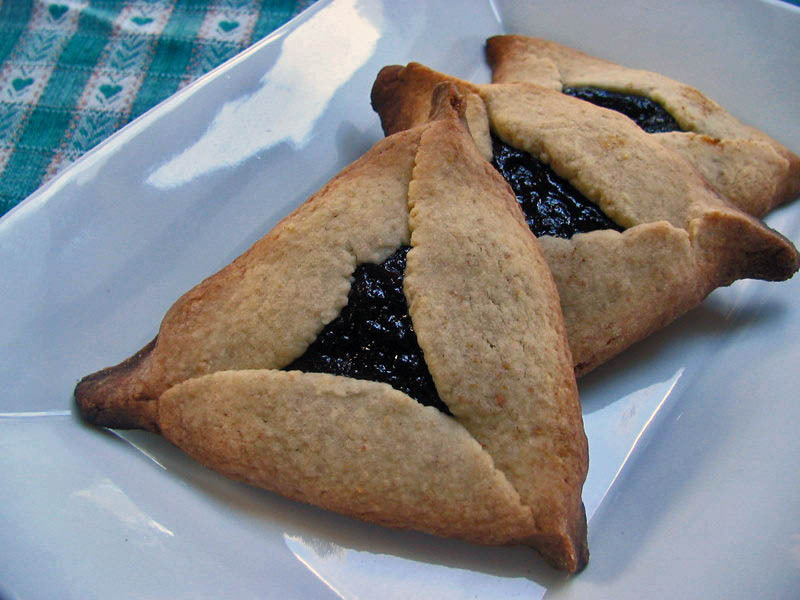 PS: I was going to excuse my clumsy effort on the grounds that I had never made or heard of hamentashen until now...but since this is your first batch too, I'd better just blush and say nothin'! 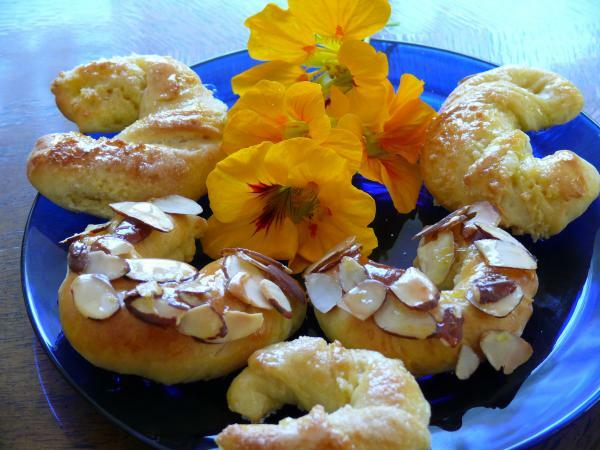 PPS: FABULOUS looking bakes, folks! Another group C member here! 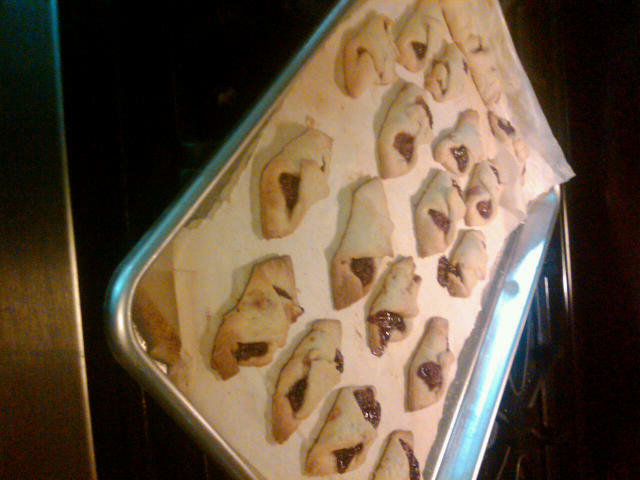 anyway, here is the photo, they are truly delicious, and I was also a hamantashen virgin until this weekend! 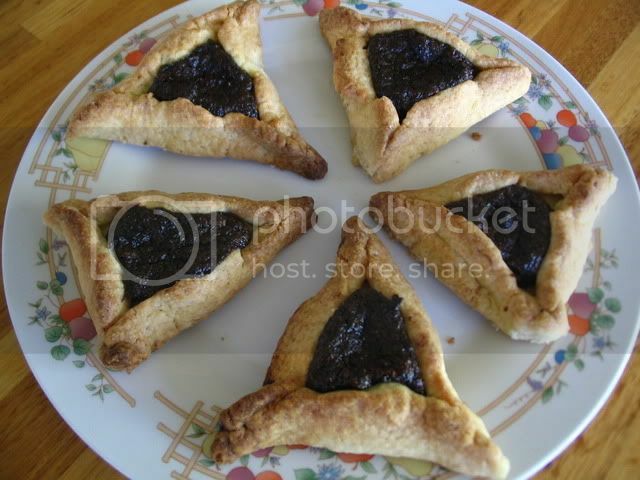 FYI, Hamentashen are traditionally made with either a yeasted sweet dough or a cookie dough. You made the cookie type, which seems to be more common these days. I have to say, yours (and all the others) look better than what appears in most bakeries, at least on this Coast. Looks like blueberry to me, but I'm not sure. We've been munching on this for a couple of days now (I baked on Friday) and I've gotta say, it's getting better with age! (I'm a little surprised). I'm keeping it in a plastic bag on the counter (ambient temp ~ 65 - 70 degrees) and todays' was the best yet. 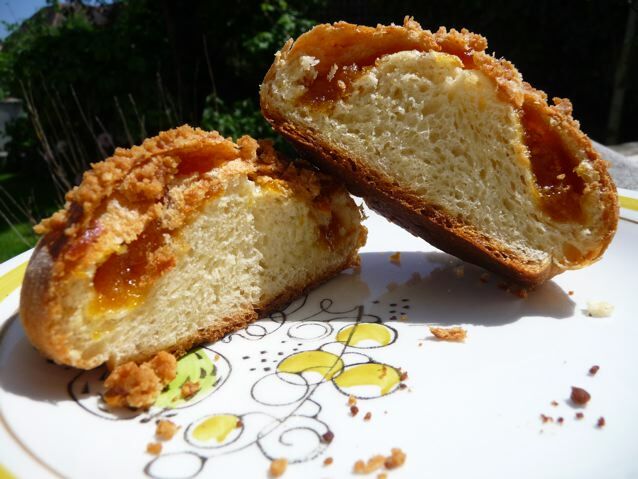 The filling's flavor is mellowing and the lemon is coming through more prominently; the crumb is moister than on the first day (moisture transfer from the filling?) and the crust is holding steady. Just something for Stan that I didn't put in the eval form! I noticed too that it is tasting better with age. Also, since I posted I've had the chance to test it on some some neighbors and everyone loved it. Does anyone have the cookie group? I'm so jealous of ya'll making those gorgeous breads! I got coconut macaroons, which my family won't like as they don't like coconut or macaroons. I'm still going to bake them of course. Man, this week has flown by and I haven't even tried my brand new oven yet! Moving into the rebuilt house. Have about 1/3 of the 558 boxes left to unpack! I can't wait for the book! 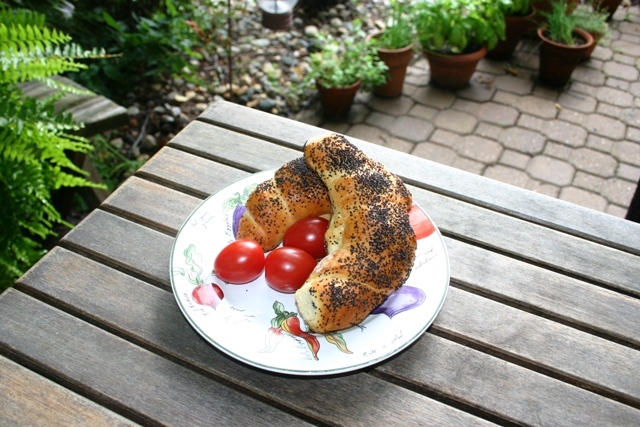 I love Norm's onion roll recipe, as many here do, and I've missed him around here at TFL. All of your bakes really look wonderful. When the book does become available I'll hopefully be done with the repair/remodeling nightmares so I can get into the kitchen with exuberance. Just baked Week #2 Bread - Potato Bread. Don't know if it is ok or not - never baked it before. I went by Stan's remark - bake until "dark crust AND most importantly my wife and I both like it. Any comment would be appreciated. We're in the same group.. 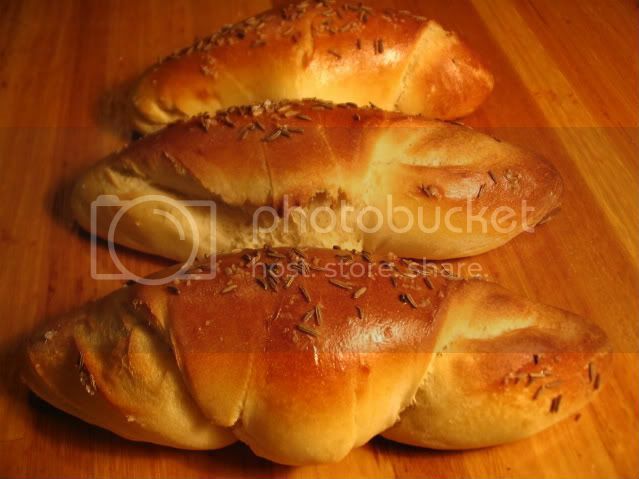 I'm baking the Polish Potato bread tomorrow. Will check back with my experience. 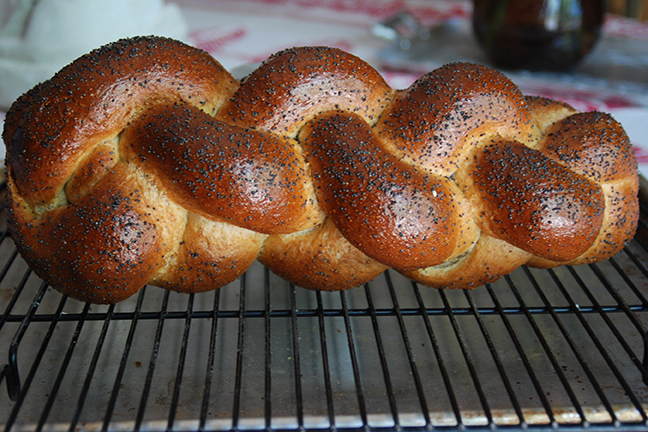 Your SD Challah looks much nicer than mine. I love the way yours is shaped. One more Sourdough Challah. My version took a slight deviation. After retarding the dough overnight I thought I had a dud, no rise what-so-ever. I left it in the fridge where it got pushed to the back for 4 days. After work last night, I decided I really should dump it and low and behold it had doubled! So today I baked it off thinking it was never going to rise and taste horrid. It was just fine..excellent rise, good taste. Sometimes it's really hard to screw up a good thing! My braiding needs some work. I have another sponge ready to go and will see if I can get this baked in a more timely manner. Special recipe resilience torture testing team captain. I salute your perseverance ... and the bread's, as well. I gather it insisted on being baked for Shabbat. This dough, created by Norm, knew it's future. This was one of a kind. The small wonders/coincidences make me realize that miracles happen every day. My new sponge has totally different energy. It will behave as the formula dictated. When is smell-o-vision coming? I just know the aroma is a killer! In contrast to Betty, I'm relieved I can't smell those onion pockets. I'd totally loose control. They look soooooo good! 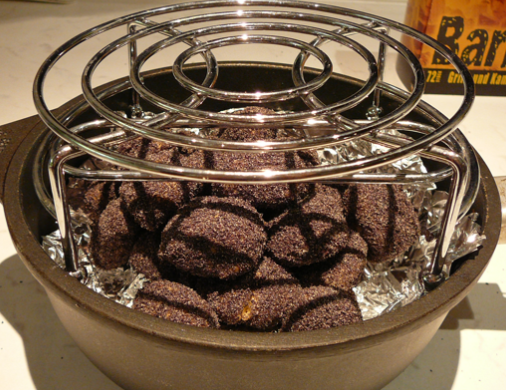 This was my first recipe to test for Norm & Stan and it was a great way to start this project. Everything turned out great and it was a lot of fun. I did cheat a bit. The braiding instructions confused me, doesn't take much, so my Wife did the braiding ad I tagged my son to do the photography. I'm looking forward to testing some great recipies. 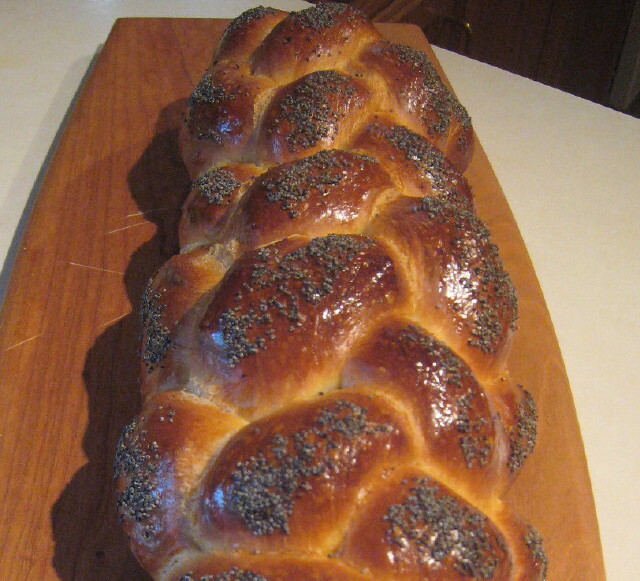 Your challah is beautiful - very nice egg wash got you great color. I agree with the "team" effort component - tell your wife the braiding is terrific and your son the photos look professional - and the team captain did a fine job tool. I am finding seeing, and sharing, with others really to be the best part of this effort. Your challah looks wonderful, Dwayne. The way I see it, the good baker is resourceful, and you are to commended for drawing on the resources available for braiding and photography. I've never seen potatonik .... I won't go on with the rest of the poem. Anyway, I have no idea whether the one I made is a good example or not. Let me begin by saying nice photos - I have never heard of potatoniks either. The criteria I always apply first is "does it taste good?" - all else is just opinion. Mine looks very similar. The smell was amazing however I didn't care for the flavour. To be fair it was stated to eat with apple sauce and sour cream, we did not. That's a first for me too. It looks like a grown up version of potato pancakes. I always thought of Swiss rösti as grown up potato latkes. Potatonik seems to be some mutant version. It smelled wonderful baking, but I didn't care for the texture. Since I have never had this dish before, I have no way of knowing if mine was characteristic or a user error. I hope Stan & Norm assigned Potatonik to at least one person familiar with it. I'd be interested in his or her assessment. your grandparents would be proud! I'll have to take your word for it, but thanks, Stan! 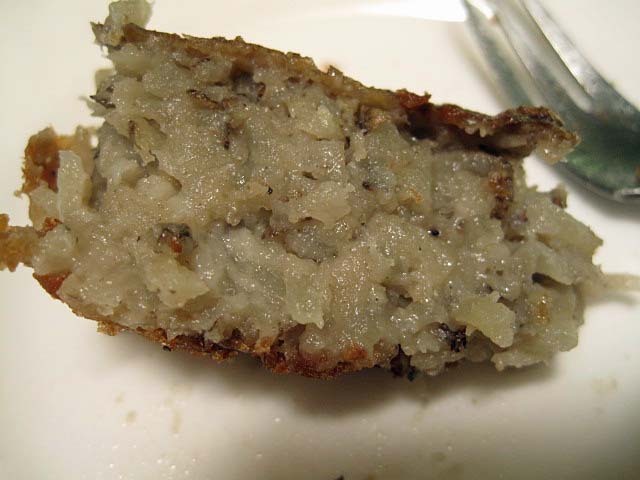 I never even heard of Potatonik until I saw the recipe in Greenstein. I liked the funny story he told about it, but never made the recipe. So, mine is the first and, so far, the only Potatonik I've ever seen. I never knew my paternal grandmother. She passed away before I was born. 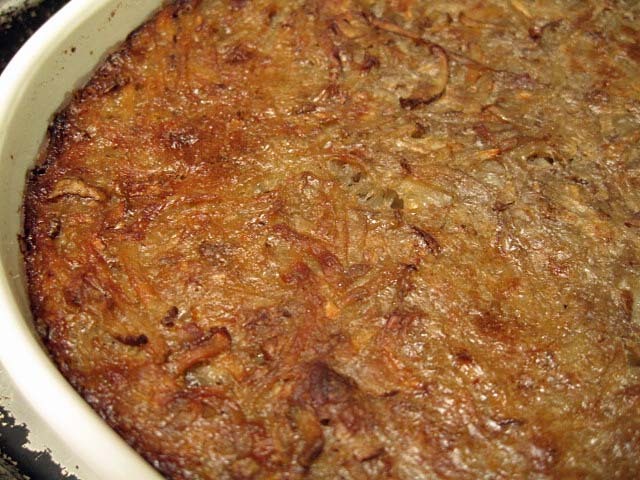 My maternal grandmother probably made potato kugel. I have no memory of it. Her specialty was a savory lockshin kugel with ground beef and lots of schmaltz. But no Potatonik. The good news on the spud front is the Polish Potato Bread recipe. It could be the ultimate PB&J sandwich bread. Yum. Another 'blind' bake! 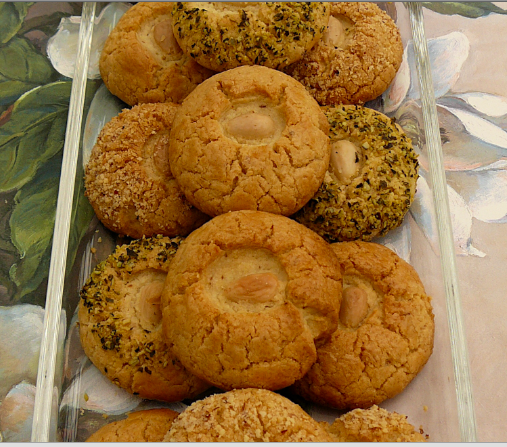 I've never heard of Honeymoon cookies, and this time I couldn't even identify anything like them via googling. So, dunno how to grade these - although I suspect they're not the best-lookin' batch in the known universe! Eating quality? Again, not sure what they're supposed to taste like, but I found these quite intriguing - the honey coating plays off quite well against the only slightly sweet, soft biscuit beneath, while the poppy seeds add another element to the texture and flavour profile. I'm finding this test-baking exercise interesting. Jewish baking is a cuisine area I know almost nothing about, let alone New York Jewish bakery specialties. 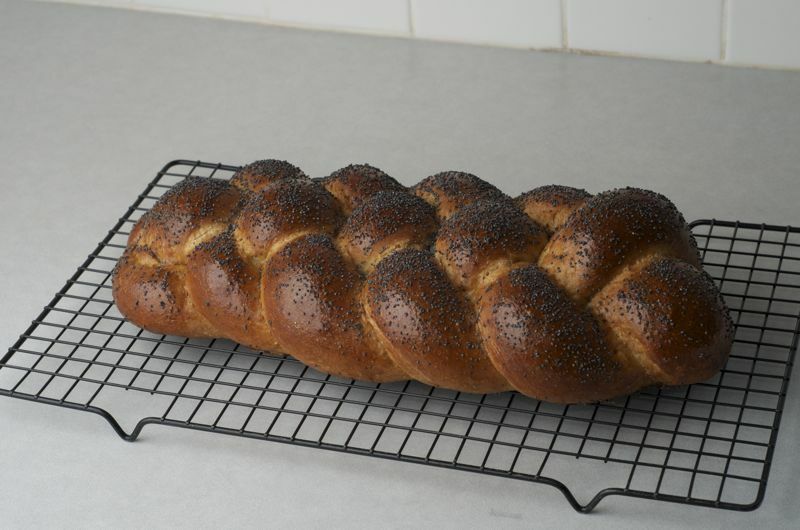 Until now, my knowledge of Jewish bakery items has been restricted to bagels, matzah and challah - and I haven't actually sampled challah of any variety, let alone baked it, although that's gonna change after the inspirational pics posted in this thread. So, this project is an education as well as a stimulating challenge to make sense of a recipe without any graphical assistance. Enjoying it, and the baking routine that comes with the testing commitment. Sally, I'm not sure how mine are supposed to look. So use your own judgement and interpretation. That's what the testing is all about. Maybe we shouldn't post our pics if it influences the outcome. Oh, no... I think it's wonderful to see the pictures of folks baking before - I guess the look of these cookies might change a lot depending on how much poppyseeds you use to coat them with. 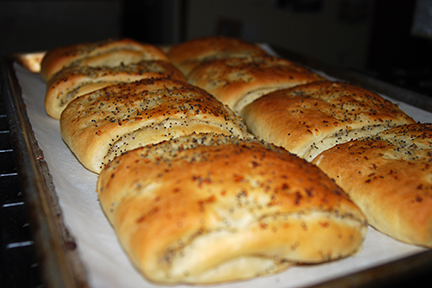 I tried to use a lighter coating of poppyseeds on mine. Today, after 4 days, I can no longer taste the honey, just "moon." I also like the whole look as compared to milled seeds. 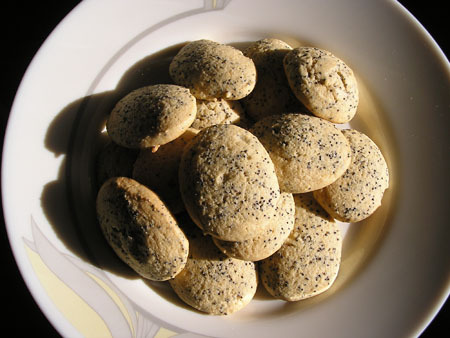 the name comes from the honey - obvious - and the poppyseed, which is called mohn in German and 'moon' or 'mun' in Yiddish. the combination just happens to make a nice fit! "Twisted Bagels" struck me as being a good name for a rock group. Week 3 and Egg Bagels. Egg bagels were my assignment for week 3. As were not supposed to discuss the recipe I will let my camera speak for me. Thank you Sir, I was just wondering how they would look, Twisted!? I too, had these as assignment 3. One of these days I will catch up and post pics of these and the Polish Potato bread.. Crashed and burned on the sour cream coffee cake -- ended up with a very, very dry cake that seemed antithetical to the "sour cream" title. The happy side is that this cake will provide me with the 1 cup of dried cake crumbs needed to test the next recipe -- Babka! And I'm going to re-cake the scck to see if I just plain old overbaked it. Other than David's photo above, I've never seen a Krakow Bagel before. Here's my effort. Chewy crumb, delightful flavor unadorned. My favorite topping is Churnuska, Poppy, and Sesame seeds with Kosher salt. Oh my! Those are really lovely! I can't wait!!! I'm working on Linz Cookies (I'm 5 km from downtown Linz!) and now I'm getting nervous... The cold dough tastes great! ... sign of a good cookie! These are, as Stan claims, very flavorful. I'm going to make them again, soon, but with conventional shaping. I don't think there will be any difference in flavor. Linz cookies! Are they the same as Linzer cookies? the two-layer cookie with a cutout (star, circle, crescent, etc.) and filled with fruit gel? I haven't had one of them in decades; when I was a child they were a favorite. We bought them at a local bakery. ...when did u get your linz cookies recipe, Mini? I'm in your group, I think, and haven't received anything since the Honeymoon Cookies (2 weeks ago now). i never got a feedback form from you for either the hamantashen or the honeymoon cookies. part of the deal was that after week 2, future test recipes would be contingent on providing feedback. I don't know why you didn't receive my feedback. I imagine I would have been one of the first ones through for the hamentashen - I baked them on the Saturday and forwarded your feedback evaluation form on the Sunday (Saturday US time)! The honeymoon cookies feedback I forwarded a couple of days ago, which was later than intended, but still within the deadline, I believe (it's the Monday 2 weeks after the recipe is sent, isn't it?). Also, knowing I was going to be pressed for time, I emailed you on 3 June to clarify the deadline for the honeymoon cookies and didn't receive a reply from you. I have records of all these emails, which I can forward to you as proof that I sent them on the dates I've specified. If that address is correct, the fault lies with our email connection (either your server, or mine), not me. Up to you as to whether you delete me from the list, but as stated above, I was enjoying the testing and have complied with the deadlines to the best of my understanding. It might be politic to actually check with people that they really haven't been complying with your requirements before deleting them on the assumption that they haven't been - especially those who have been contributing to this thread.That is surely some indication of ongoing enthusiasm and commitment to the testing tasks that suggests something else might be awry other than simply not bothering to send in assessments? first, with upwards of 150 active testers and 9 recipes a week to put out and keep track of -- in addition to doing all the other stuff Norm and i usually do, like making a living, etc. -- individual follow-ups when testers don't send in their feedback becomes challenging. our assumption is that some people will simply drop out -- as has in fact been the case -- and that the technology that has brought us all together is *usually* dependable enough that most emails will get through without problem. if, in fact, excluding you was our fault, we apologize: your participation, like that of all our testers, matters very much to us both as a contribution to the quality of the book that ultimately will get published, and also, and more importantly in many ways, as a show of support from this community, which we value enormously. as it is, i checked back multiple times and your feedback for Week 1 did not arrive by last week's cutoff. consequently, we dropped you from our list, as we did about 2 dozen others who signed up and failed to respond. i'm sorry we cut you out in error; i'm glad you brought it to our attention; i would have preferred that you contacted us directly. 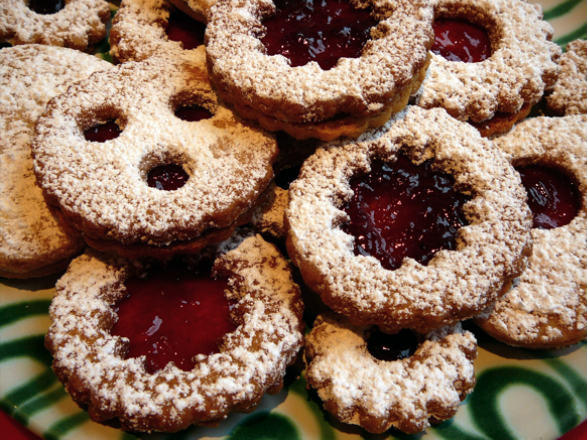 as i said, we'll be in touch offline about getting you the linzer recipe and other issues you raised. thanks again for your continuing desire to be part of this project. Yes, I agree it would have been better for this whole matter to have been handled with PMs. That was my intention. I did email you to ask about the next recipe when it didn't arrive, but received no reply. That's why I had to resort to raising the issue of the apparent non-arrival of the recipe in my inbox on this public board - direct communication with you hadn't yielded any response, and it seemed that it wasn't going to! I can only think that my multiple emails to you (and on checking, the email address I used was correct), including both evaluation forms, were perhaps wrongly recognised as spam at your end - or something like that. I have now forwarded each of the mails concerned to you so you can see the date and time they were sent. Anyway, all's well that ends well, which seems to be the way things are heading now. Nothin' like a happy ending! I'd thought you'd eaten all the cold dough; never got to bake the cookies. I'll take a dozen! those are them! so how did they taste? how was the mouth feel? 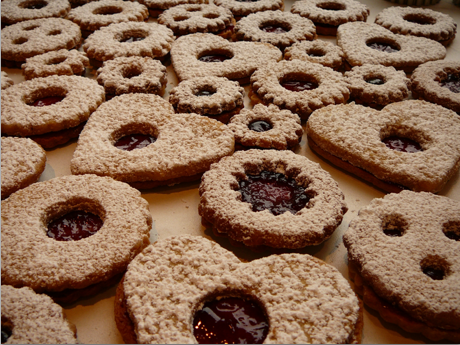 Linzer cookies look delicious, Mini! I brought some over to my MIL who normally kicks these out by the dozens before the Holidays. Rumor has it we might be switching the traditional formula this year. They really are good! 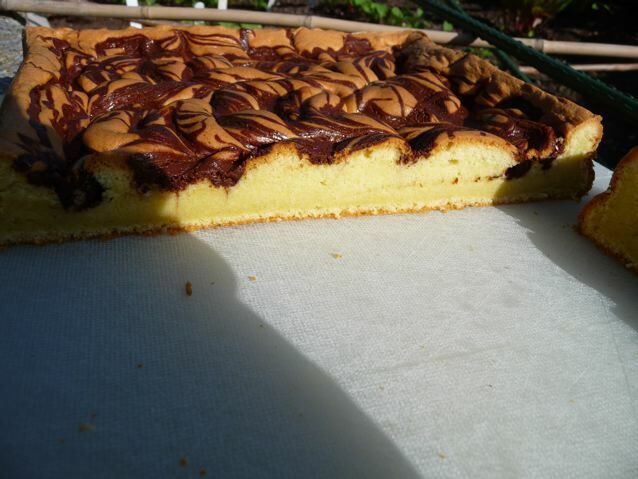 Like a cross between a Linzer Torte and Linzer Augen! Mouth feel, wait, I have to eat another one to check on that... moist but not quite falling apart, nutty, delicate, sweet from jam and tart too as a follow up as it melts on my tongue and then there is a little bit of caramel taste that makes me lick my chops and follow my tongue around my teeth releasing a smacking sound and searching for every crumb. Even the slightly darker cookies are keepers. 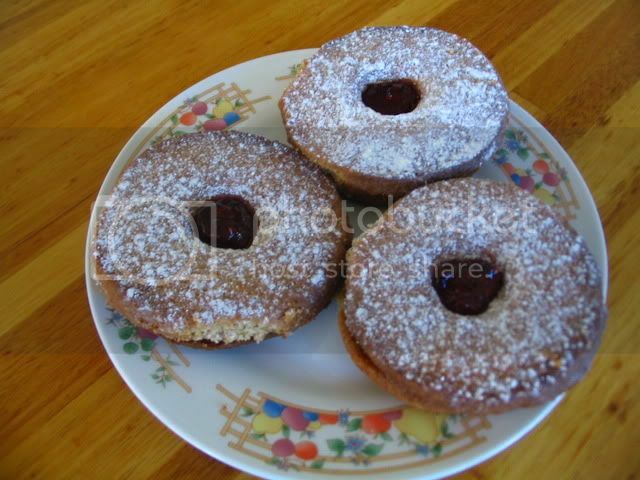 The ones with 3 holes are traditional Linzer Augen (Eyes.) 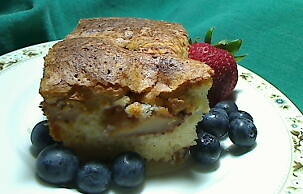 The crumbs remain a secret but very much like a jelly roll or pound cake. That's a bread-and-butter plate they're on - they're not gigantic wheels of cals, as they appear. Nowhere near the finesse of Mini's, of course, but a very nice treat with a cup of tea or coffee. Thanks Mini for providing this link. Now that I have the book and have this link it is wonderful to see all of the interesting and beautiful baked good being produced! 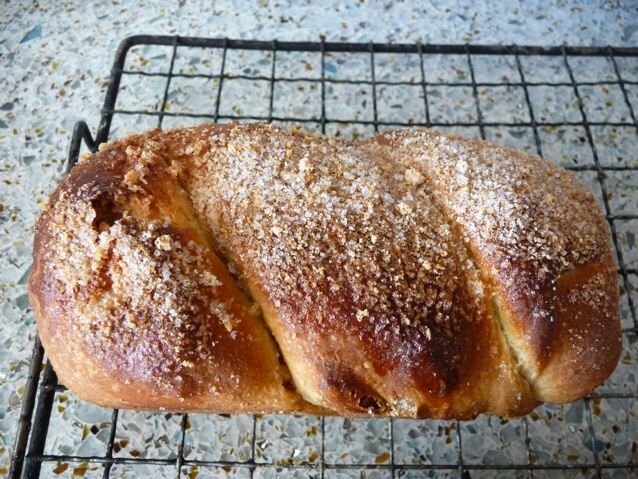 So, no skiing today, BUT I have a coffee cake dough in the fridge to make those walnut Hungarian rolls in the morning, the second build for the classic Jewish NY Deli rye starting to get happy and a sponge started for a half recipe of the Bakery Challah. I have omitted the yeast and used about 10% sweet levain and 10% yeast water levain. The sponge included the levains, sugar, 130 g 90F water, 150 g strong bread flour and 65g egg yolks. It looks pretty bubbly and happy after an hour! 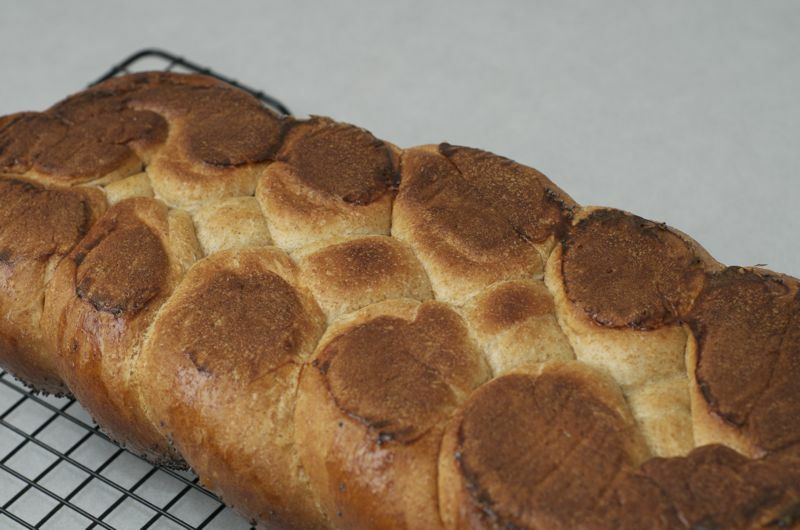 I will be interested in trying a different braiding style with this bread This dough is much like my beloved pulla, with WAY more egg and yolk and no cardamon -- sigh! one question for you... how did you proceed for the cake crumbs? Did you bake a cake and dried it, used a store bought cake? Frozen cake? Which flavor? and added neutral low salt white bread crumbs to it. My MIL sugested Brioche crumbs when I asked if they had some at the bakery. What ever tastes good will also taste good in the cookies. Don't worry about it too much. The Konditor (Caker) uses all the little scraps from the cake edges for crumbs. So just about any cake or two will do. I baked one day, cooled and stacked the cookies inside plastic ware and continued with filling them the next day or whenever there is time. Once the cut out shapes are sprinkled with powdered sugar, it covers a multitude of irregularities. It doesn't all have to be done in one shot. Mini's right on the mark. 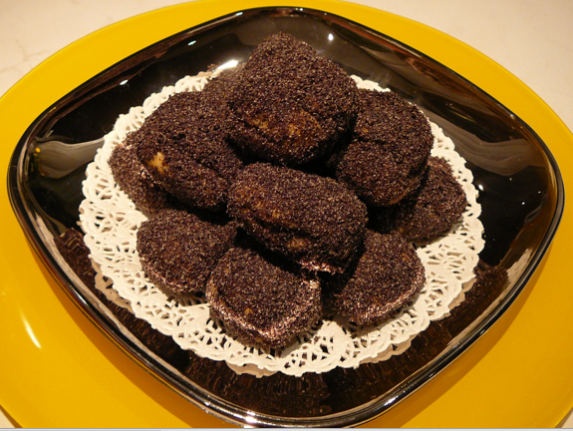 any crumbs will do, including unflavored bread crumbs when cake's not available (take that, Marie Antoinette!). only thing to keep in mind is to reduce bread crumb amounts by 15-20% when you're substituting, since they're much more absorbent than cake crumbs. (I tried to edit but Stan was too fast.) I did buy a cake, it was cheap and saved me lots of time, granted, it is a cheap Austrian cake, low salt and similar to a pound cake. It's berry season and it was on sale. I cut it up and tried to dry it as much as I could but it stayed moist. It lost a little weight and I made up for it with dry bread crumbs. As Stan states, they are dryer than cake crumbs because cakes are enriched. I was worried the cake crumbs might be too moist and I might need more dry ingredients but they balanced each other nicely. Had I used less cake and more bread crumbs, I would have had to reduce the bread crumb amount. that she just posted. I understand we are going to need some more crumbs. It's sure to be a good one! We could nibble off some of the cake and then crumb the rest and freeze! It might even turn you into a cake person. I want to eat the crunchies off the top first. They look so gooood! Use a couple of bread pans and go for it! Thanks for the pound cake reference, Mini! 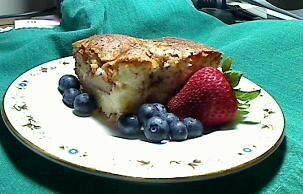 It has a very crunchy top but the cake part may be to moist..though you can crumble it. It's definately not a dry tasting or feeling pound cake and has a lovely creamy flavor. I think I'll bake it tomorrow but it might not go for crumbs. I don't think it will live that long. I have a brand new bundt pan I want to test. The cake I used for crumbs was also not dry, in fact it refused to dry out. I think the crumbs collecting in the cake shop kitchens comes from deliciously moist cakes too. Would they bake anything less? I didn't dry my cake crumbs at all. It was a very oily dough and I think there was way too much shortening in the recipe - so much so that it was unworkable until I added an extra 100gm of flour. How much did you add, I wonder? Like Mini, I used unsalted butter, but ran out (!) and had to top up with canola oil. The finished biscuits were still brittle and tending crumbly, as will always be the case when you have such a high fat content. I suspect the result would not have been up to much without the additional flour, but as things turned out, mine were delicious. Brought back nice memories of Christmas in Germany, probably due to the ground hazelnuts and cinnamon resonances. Haven't taken any pics yet...will probably upload one tomorrow. Mine are never as elegant and aesthetically delightful as, say, Mini's, but I figure it's interesting to compare each other's bakes. Dunno about others, but I'm baking 'blind' with all these recipes so far. No cause for embarassment if things don't quite work out. Although, looking at my hamatashen compared with the others, I'm not immune from the feeling! you can't sub oil for shortening or any fat. oil will not firm in the fridg it will stay liqued ant even frezzer temp thats the reason for a sticky douth that will not firm. shortening or butter will get hard at cold temps think what it would be like making a pie dough with oil. please follow the formulas as written and mesure or scale with care and the formulas should work great. remember these have never been in print before untell you count crumpled stained aging and torn hand written scraps of paper. some have never been written down at all they are only in my head as they have been passed down verbily from other bakers. into the book "Do's and Don'ts" with substitutions. Ross, keep in mind, I did't post the "other" cookies that didn't turn out well. If there is enough dough, I shape following the guidelines the best I can and then try a few ideas as well. You only get to see the cookies that "posed." The lot on the side have their own stories... the Hamatcallas and the Hamatsusans, the Briquettes, the Linzer-squished and Brokeback pieces from moving the cookies too soon off the hot sheet and finally the Almond-splits (I wonder if they aren't too high but that is Norm & Stan's job.) The only ones I've made before are the Linzer ones thank my Inlaws -- great teachers with the "Intro to Linz, Austria 101" course. The others are all new. My main "Lab Rats" could care less how they look, important that they taste good. I keep wanting to make the cookies smaller... so I & others can try more cookies when presented with an assortment plate at Coffee Trinken Time. The tendancy in America is to make them big which is great for the bag lunch or the kids or the "grab and run" maneuver. it is the ones that dont come out right are the ones we learn from. so please post them as well my fealings wont be hurt. it is a way or me to check the math and see what happened. both stan and i are checking very carefully. we don't want to end up with an error correction sheet like some other books. OK, nbicomputers - here's a point to be considered! The term 'shortening' is, I think, widely used in the States (don't know about England), but not so commonly in Australia. Here, instead of using the term shortening, recipes would simply specify 'butter', or 'copha' etc. I have used oil instead of butter/lard/copha etc many times in baking (not my choice - partner has health issues), and have never had a problem. This includes cakes, biscuits and the like. Not pies or pastries, though, which obviously do need butter or some sort of solid fat. I am aware that you didn't want testers to substitute other ingredients, and as far as I was concerned, I was not substituting when I used oil to top up the butter after I ran out. I would have thought oil was as acceptable as butter, and only used butter because I think it tastes better in biscuits (and in most contexts, come to think about it!). So, here's an instance of 'cultural confusion', for want of a better word. If you are anticipating a market for your book extending beyond the States (as I expect you are), I believe you need to make it clear in your recipes exactly what does and does not constitute 'shortening' (maybe just a note in the intro section would suffice?). It might even be worth putting the shortening options you consider acceptable in parentheses next to the word 'shortening' in the recipes. oil will not firm in the fridg it will stay liqued ant even frezzer temp thats the reason for a sticky douth that will not firm. That's not correct in my experience. I have several bottles of preserved chillies in oil in the fridge, and a jar of olive oil infused with garlic and herbs I use in salad dressings, and in all cases the oil is solidified! I always take my salad dressing oil out of the fridge for some time before using to allow it to liquify! Further, oil content notwithstanding, with this recipe my dough was so firm when I took it out of the fridge that it was difficult to work until it warmed through hand-kneading - actually, it was so hard after its time in the fridge that it was difficult even to get it out of the bowl initially! And as mentioned above, the end result was excellent! Perhaps I used just enough butter to save the day: reviewing my notes, I used 135gm butter and 205gm oil. This is not the first recipe I've tested in which my findings were that the ingredients were out. That's not a criticism as such. It's just that I thought one of the points of this testing project was to fine-tune the recipes and modify those in which one or more ingredients were other than optimal in quantity? With respect, if they all worked "great" as is, why would there be any need for testing? shortening refers to any fat that is solid at room temp about 75 F wihich oil is not. Also from what i read you used more oil than butter. to me thats not topping off to my understanding of the meaning and will make major changes to the formula. (forming a sticky paste rather than a dough). Further, oil content notwithstanding, with this recipe my dough was so firm when I took it out of the fridge that it was difficult to work until it warmed through hand-kneading - actually, it was so hard after its time in the fridge that it was difficult even to get it out of the bowl initially! i hope this clears up any misunderanding and thanks for helping us test the formulas. I mean this truly as a friendly suggestion... you may not want to include scientific statements in your book without having a qualified scientist thoroughly review them. I too have found that oils (specifically olive oil) that are liquid at 40ºF when pure become solid at that temperature when mixed with an acidic substance, in my case vinegar. There is usually salt, pepper and herbs, mustard and other stuff in the mix, too. The scientific name for this compound is "salad dressing." 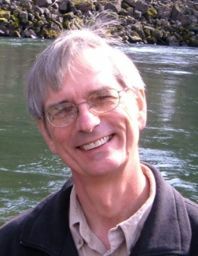 As one of our "qualified scientist" members - a biochemist, as I recall - can you offer a corrected explanation for Norm's? My comment was merely meant to draw attention to the fact that mixing two substances together, and thereby causing a change in a physical property (e.g. adding salt to ice to lower the ice's melting point... the scientific name for this is "salting your driveway"), isn't necessarily the result of changing either of the substances' molecular structures. One can affect intermolecular interactions, and thus certain physical properties, without changing molecular structure. when I put my oil, vinegar and herbs in a blender it becomes creamy..I always refered to it as 'emulsified'. Would this be correct? David, I am a biochemist, although I have to say that the word "biochemist" conveys a huge HUGE world of stuff - being a biochemist does not make a person an expert in fatty acids, for instance. However, when you mix an oil with things like vinegar, mustard, herbs - you are not solidifying the oil in the sense of changing its chemical basic structure, you are only making an emulsion, "suspending" the oil into a hydrophilic (aqueous) environment. The issue, though, is the state change that occurs in salad dressing when it's chilled. Time to search. No, that was not the issue I raised. I'm still waiting for Norm to explain how an oil's molecular structure is changed by adding herbs, as he stated in his post. David, my salad oil is not a dressing as such. It is just extra virgin olive oil infused with cut garlic cloves and sometimes - but not always - herbs. There is no vinegar. I add vinegar only when I make my dressings, which I do just before serving salad. I never store dressings - only the garlic infused oil. I find dressings taste better assembled fresh with herbs plucked straight from the garden. Scientific explanations aside, here's a simple experiment that will clear up any doubts over whether olive oil does or does not solidify at fridge temperatures (not addressing you personally...just writing in the context of this discussion): store some olive oil in a jar by itself in the fridge for 24 hours then have a look at it. In this case, you don't need scientific expertise to assess the facts - all you need is your eyes! Yes, let's stick to the facts! Yes, quite correct: I used the term "topping up" erroneously, before I had checked my notes. I did indeed use much more oil than butter, but it is not correct that this resulted in a 'sticky paste rather than a dough'. It was never sticky - just oily! And with the addition of an extra 105gm of flour, it was certainly a dough! lasty the hard condition and the fact it needed to be kneaded is normal for this dough (and this dough is in the family of sweet short pastry) is absoluty normal and was in the instructions. Yes - and this is my point! 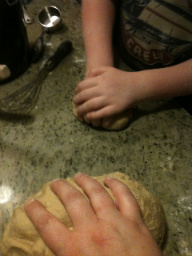 The dough and the biscuits worked out fine - and behaved 'normally' as you put it, using 2/3rd oil! I'm not being deliberately awkward here - just relating the facts as I noted them. Theory is one thing; practice another. I should add that I am simply stating my truth as it relates to this recipe, not defending my use of oil. I have noted and accept your point that it does not qualify as 'shortening'. Now that I know that, I will not be making such a substitution again. for the Linzer Cookies either in the recipe or as a tip. It is very educational. Keading while cold is called breaking the dough and will cause a very slight gluten devolpment which is necessary to roll out the dough without breaking. I let my dough sit out for a half hour before rolling, I cut the kneading short thinking it was only to warm up the dough a bit. Had I known, I might not have squished up the dough half way thru the first roll because the dough was ripping/tearing (but that is really nothing new and now I know why, Thank you!) It stuck to itself nicely when I overlapped the rips to mend and when I set two ripped cookie pieces together they baked out beautifully. Yes, I would have preferred cold with a little more gluten. Instead of warmer dough with less. That is my fault but the info would have been useful. I did use more flour than my average for rolling out the dough, which was AP. I still love the dough and the mouth feel and taste is in high demand. The cookies made it to a prominant coffee circle. I have been asked several times already for the recipe. Which I am safely guarding. A plate of cookies also went to my neighbor when I asked to borrow him & his tractor, absolutely no problem! The next day the plate was returned with a smile. So now I'm working on my garden steps as soon as it stops raining. 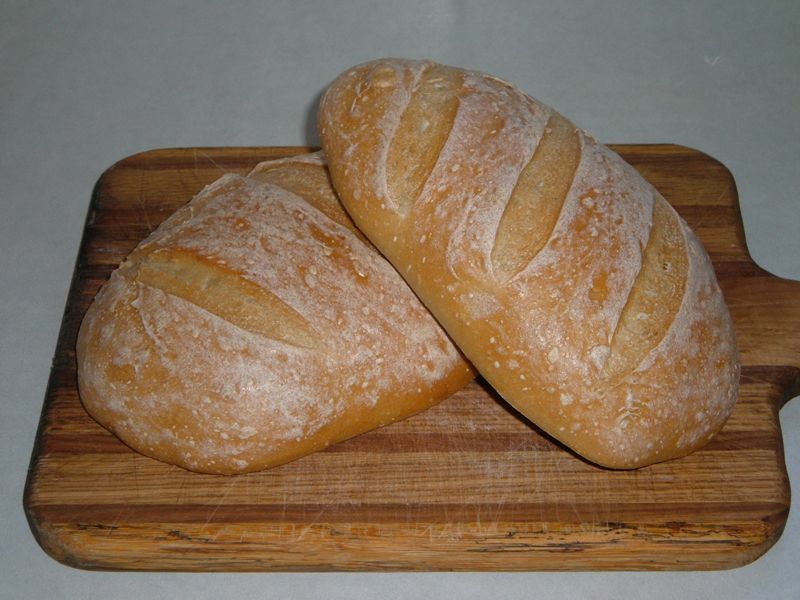 two will develop a very small amount of gluten which makes the dough abale to be rolled with out the dough tearing or crumbeling. also note that the dough shoule only be mixed once. then fresh dough should be placed in the mixer along with the scrap dough left over from cuting out the cookies and mixed together. without adding fresh dough and the last two ugly shaped lumps of dough still had a good mouth feel. I ate them first while I was testing my jam. This is the stuff that impresses me. I did not go to the coffee with the cookies. The requests came over the telephone! So stay floating! I let one Chinese Cookie get hard. I stuck it in the cake box with the last of Sylvia's pound cake for about 6 hours and last night I ate it, soft and tasty with a glass of milk before bed. Another good point. Keep floating! I wound them really tight to see how much they would expand. They tripled proofing and boiling, and still doubled with oven spring. 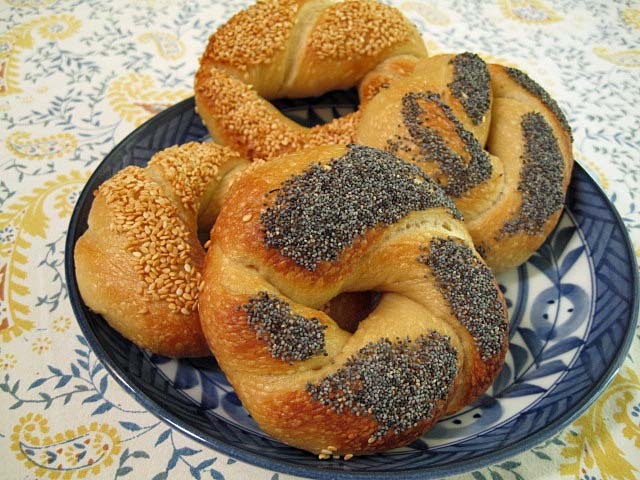 These are lovely, if I ever get around to making bagels these will be my first shape to make..lovely...and I love the really big ones in the photo sent in above, nice work. Does your comment mean you've never made bagels, or just not recently? If the answers never, I'm amazed. I thought there's nothing you haven't baked, and baked well! and my husband used eat them all the time. To many carbs and just not a bagel fan; I guess is my best excuse. I do like the look of the twisted ones. When I have eaten bagels I like the ones with dried fruit in them or plain and toasted. Sorry folks I have been busy with this book. Bakers do not waste anything. If you want to be real bakers that is the first rule to learn (well it was the first thing i learned and it was a painfull lesson as i felt the slap of a german hand on my head as i put a few used pieces of parchment in the trash). Anything that does not get sold goes into the crumb bin. Left over cinnamon buns, leftover Danish. Left over doughnuts, croissants and of course left over cake is used for crumbs. In fact anything that does not have heavy icing (the white icing on buns is ok) such as butter creams, cheese fillings, fruit fillings, and jellies and jams are used for crumbs. When they are completely dry grind them up into crumbs when ground use a course sifter get out any pieces that did not grind and as long as they are completely dry they will hold for 90 days and longer. i am sure you will accumulate quite a lot of crumbs very soon. Baker's use these crumbs as a way to prevent loss of money and time. In addition, in some formulas they add texture and a great flavor. If you end up with too many crumbs, there will be formulas in the book for nut cake and spice cake. Should you make to much spice and nut cakes guess what! The stale cake made with crumbs GOES RIGHT BACK INTO THE CRUMB BIN TO MAKE MORE CRUMBS. So stop feeding the garbage and start feeding the crumb bin. So surprised to find that reference! Now if you mention MST3K and Joel I'll faint. We felt that Joel had so much more humility as the host, he was able to stand back and let the 'bots have the show, be their straight man even, whereas Mike always seemed to hog the camera, he didn't seem able to really step back, at least not as the host - he was always mugging. When he was a guest character while Joel was the host he did do some great stuff. Different strokes for different folks I guess. Anyway, what a great show it was. We have all the Joel tapes (even back to KTMA) and often watch them while drifting off to dreamland. Gamera, etc. i have seen and know of only one surviving KTMA fan tape if you have more i would gladly pay for a copy ( it more customary to trade in true MST3K tradishion (sp) but i don't have much other than other digital downloads. I'd be happy to make you a copy of the KTMA season. 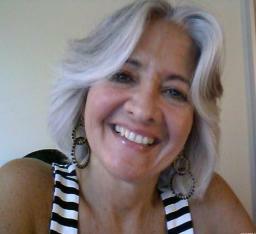 I sent you a message to get this posting off the discussionn of your book and recipes. For the second week's recipe I made Onion Pockets. They were terrific and I will certainly be making them again. I was a bit careless in the shaping and cutting of the pockets and so had quite a wide range of sizes. My tasters (I shanghai my family) and I each had one hot out of the oven (Stan & Norm: sorry we could not wait the 30 minutes). For lunch this week I used one to make a great sandwich. The flavor was great, soft crust and a the texture of the crumb was great. 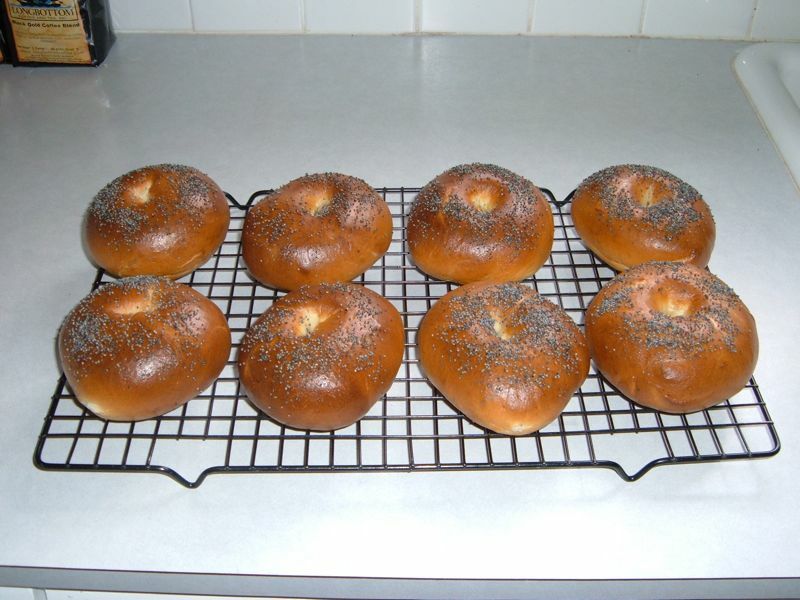 I look forward to making the next recipe, which for me are the Montreal Bagels. I've had some problems with bagels in the past which I hope I can correct. Filled fruit buns - look a lot like the ones posted above, phew! and I believe the expression is 'crashed and burned' on the Wonder Cake. Stan has sent me nice email about the Wonder Cake, so I am carrying on regardless with my British flours and my hand mixer. Any one else do this one? It's vey challenging, the idea I guess, doing these without a picture, so it's lovely to see your pics here, I wish I had thought to come and look right away! don't waste it. cut it into small pieces and let it get dry , grind it up for cake crumbs for cinnamon buns danish or some of the testing formulas. It was delicate, it was buttery, it was good. And now it is (almost) gone. I considered scoring the loaf, but the instructions didn't call for scoring. As expected, it split. I like the rustic look. 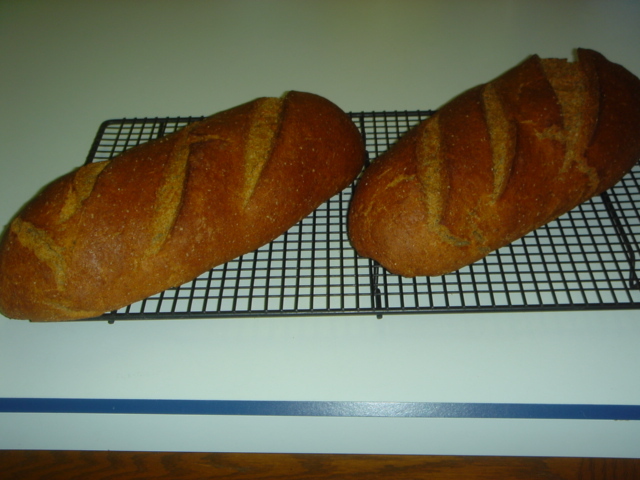 I like to let rye breads rest for at least 24 hours before I cut them, so I'll post a crumb shot tomorrow. That is one FANTASTIC looking loaf. When are they going to get the smell-a-vision working!? I'm impressed with how round it is. The Greenstein recipe tends to produce rather flat loaves. I hope you post a crumb shot and tasting notes. The bursting testifies to the oven spring you got. I'm making mine today. I may try docking the loaf. 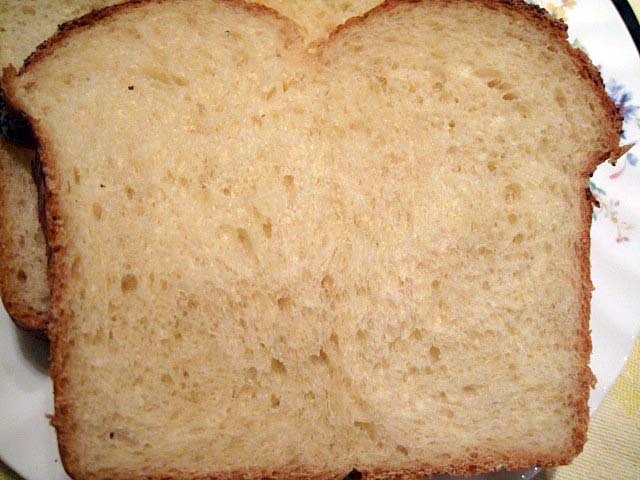 Docking is the term used for poking holes in the top of a loaf before baking. This is to "let off steam," as far as I know. 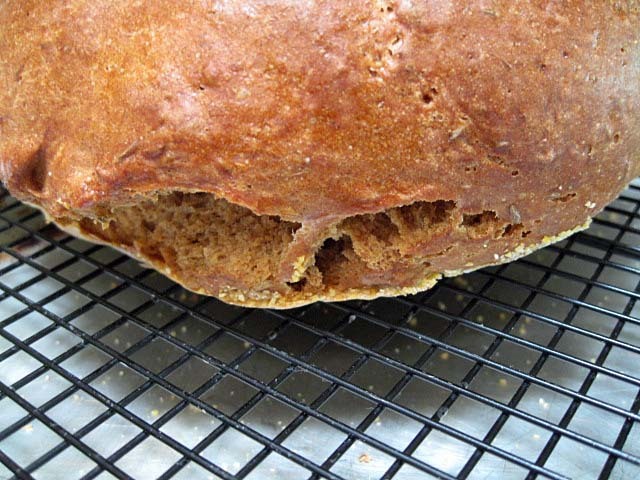 It is an alternative to scoring to keep a loaf from bursting. AFAIK, docking of this sort is only done with rye breads. 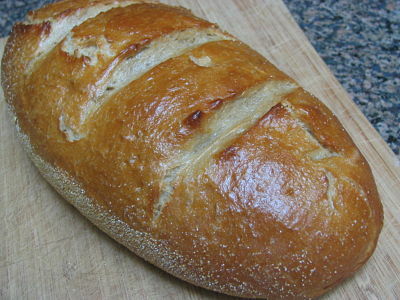 See Corn Rye (Kornbroyt) reprise in this topic for an example and Hansjoakim's Favorite 70% Sourdough Rye for another. In commercial bakeries, this is done with a tool - a roller with teeth sticking out. I use a chopstick. 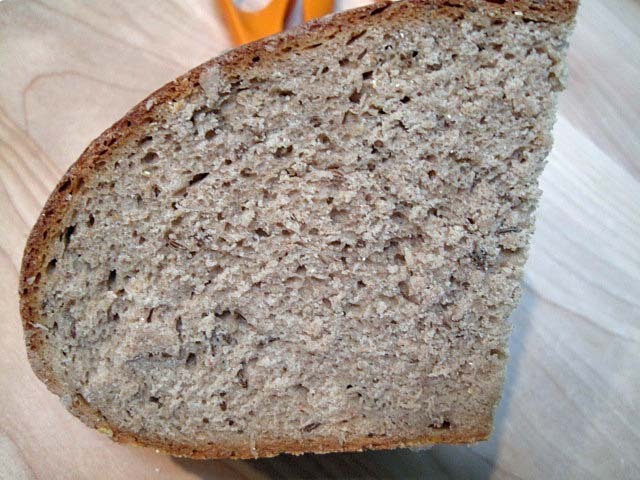 Crumb:dense but not heavy, chewy! 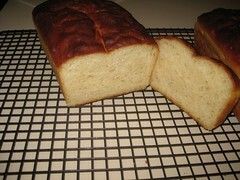 Flavor: Rye and Caraway--I cut back on the caraway by 1/3; glad I did, it's present but not dominating. This is rye bread at its best. Toasted, for breakfast, with a dab of butter. Had to have seconds. It is delicious, indeed. I had some toasted this morning too. 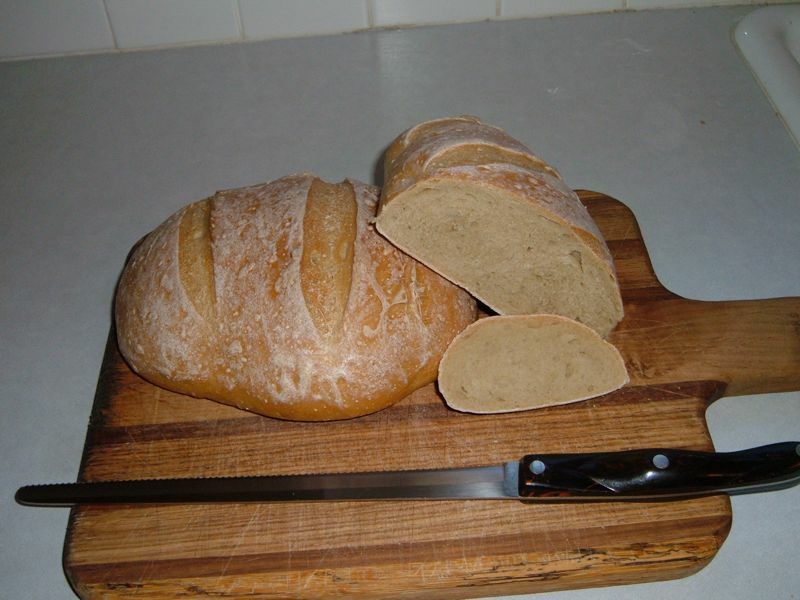 I'm thinking of making another this weekend for a rye-loving friend. It's a near dead language - Yiddish. But Corn Rye lives on! Whatever you call it. I didn't get as much bursting as DavidG. Having the benefit of seeing his bread, I let mine proof longer than I would have otherwise. I got one minor burst on the top and a couple larger ones at the junction of the sides and bottom of the loaf. sliced this yet. I might wait until tomorrow to slice it, but I will keep smelling it! Added: I was weak. I only lasted 6 hours. The crust is thick and very chewy. This is a dense, heavy bread. For a rye lover, it's a classic. I've never had a corn rye this good. 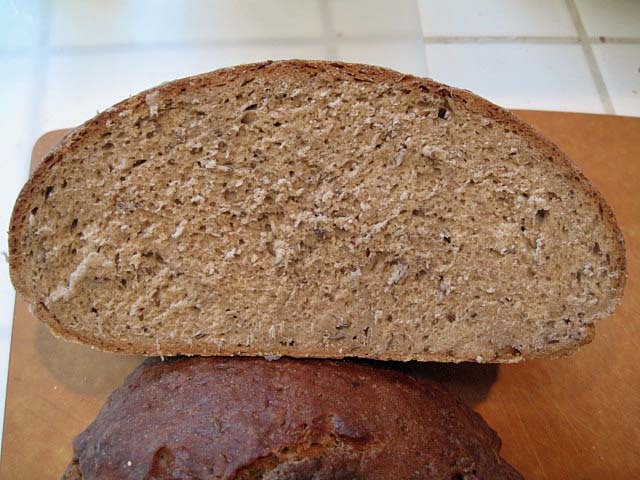 It is moderately sour with a strong presence of both rye and caraway flavors. 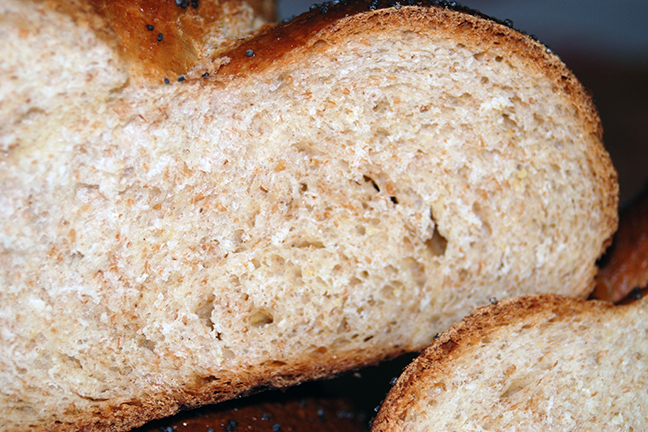 The crumb is also quite chewy, even though there is no perceptible gluten development. for a real taste of home (at least for me -- and healthy diet be damned) try it with a schmear of rendered chicken fat and a little salt, or the way my grandmother used to eat it -- lightly rubbed with a cut clove of garlic! I've never seen a chemical analysis of schmaltz. It's liquid at room temperature. This means it probably doesn't have a lot of saturated fats. Who knows? It might be as good for you as olive oil. Anyway, garlic is well known to be an essential nutrient. I'm sure it counteracts anything harmful in anything. Or, you could roast the garlic until soft, then blend it with the schmaltz, and make a Jewish garlic butter. We functionally do this by braising a whole chicken with 40 cloves of garlic in a paella pan, then taking the rendered fat and pan juices and roasted garlic cloves and smearing it on bread. It's delish. Oh, that sounds good, Urchina! I hope I remember to do that next time I roast a chicken. I never knew my paternal grandmother, and I don't know much about her cooking. The one thing my father told me about it (frequently) was how she made roast chicken. She made a paste of schmaltz, salt and crushed garlic and coated the chicken with the paste before roasting it. The drippings must have been wonderful! I often spatchcock (butterfly) our chicken before roasting flat on a rimmed baking sheet. I cut out the backbone using kitchen shears, flip the bird over, break the breastbone by pushing down on it, then run my fingers under the skin to loosen it. Then I put a mix of minced garlic, salt, pepper and olive oil under the skin, on the breasts and thighs, and then lightly oil and salt and pepper the top of the skin. Roast in a 425 degree oven till done (about 35-40 minutes for the birds I normally get). The rendered drippings are amazing as a dip for crusty bread (and as a subsequent base for chicken and vegetable soup or chili), and the chicken is flavorful, succulent, and tender. And don't even get me started on the skin. I think I would have liked your grandma's cooking, especially if she made Babka. It's my new favorite. and that MD after your name gives added weight (which I surely don't need) to your words. Can I say that my doc said it was ok when my cholesterol breaks 400? McGee, Harold, On Food and Cooking: The Science and Lore of The Kitchen, Scribner, NY, 2004, pg. 800. Among animal fats, chicken fat is lowest in cholesterol - 77 mgms/100gms. Clarified butter is 200 mgms/100 gms. Note: All data are without garlic. David, you blow me away! no wonder grandma always preferred schmaltz to butter ... somewhere, deep down in her Ukrainian Jewish soul, she just knew, even without all those fancy-schmancy statistics. And now you know why they didn't eat too much coconut in the Ukraine. And here comes Chinese Cookies! I haven't had one of those in years! I used to love them. I don't see the "green ones." I rolled them in chopped pumpkin seeds, the two go well together, almonds and pumpkin seed. After the honeymoon, I was afraid to overdue the rolling in the seeds. These were the first to vanish. If the almonds are "eyes" then these look like dragon eyes to me. Those Ryes turned out fantastic! I can't wait! And that walnut roll... fruit rolls... oh my! Virgins in the bathtub. Now dragon eyes. Sometimes, a cookie is just a cookie. The best ginger ale in the entire US of A! Haven't seen any of that here in the RSA. There are, however, some pretty decent ginger beers available. Still, Vernor's. The gingery burn in the throat, the tingly tickle in the nose... Float a scoop of vanilla ice cream on top and it just doesn't get much better. One of the few things in Michigan that still works as good as it used to. The last couple of times I've been home, I've seen Stroh's ice cream. Any connection to the Strohs of brewing fame? Oh, Paul. I haven't done that for so long! My father's preference was chocolate ice cream. Excellent! Vernor's has been available in California from a plant in Gardena (LA area) for quite a while. Before that (1960's), my uncle, who had moved to CA to attend Stanford Law School and stayed in San Francisco, would bring back gallon jugs of Vernor's syrup when he went back to Detroit. it you guys ever go to Brazil, try a soda called "Guarana' " it is similar, although slightly more sweet, but very delicious too. Vernor's is amazing, at first I thought all ginger ales would be the same, so I bought one of those "generic" kinds: huge disappointment. I am surprised they are allowed to call it by that name! You're right on about Vernor's still going strong (and cherished) here in the rust belt of Michigan, Paul. And yes, Stroh's Ice Cream was part of the Stroh's Brewery - fab with Vernor's poured over it! Better Maid is still in business and producing great chips. I recall going to their plant to buy a large bag of their "overdone" lovely brown, caramelized chips for all of twenty-five cents. Now they're selling them for about three bucks. Really enjoyed these. Easy, relatively quick and delicious. And sub-lethal butter content, for a change! Very tasty and turned out great. This is my first successful rye bread from sourdough starter. I can't wait for the book to be complete. I see so many things I want to try- the twisted bagels, challah loaf, walnut rolls & onion pockets all look great.- ok actually everything looks fantastic! Very exciting! Should the dough be fermented/proofed to the point it bursts less, or is the bursting expected and desirable? Do you ever dock corn rye? In an oven with steam injection ( yes i know not many people have a boiler or steam injector on their oven) there is enough steam to keep the bursting it a minimum. 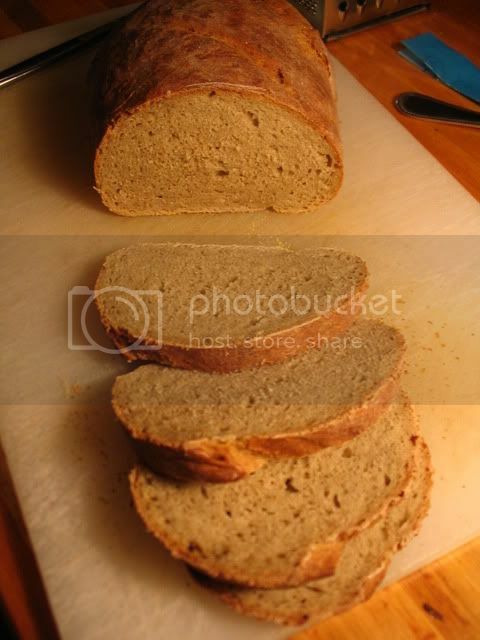 my corn rye would open at the bottom as your picture shows but the crust on top would hold. In a home oven docking the bread a few times with a stick (like a chopstick) should help. using as much steam as you can make will help also. Best guess since i have never used one. 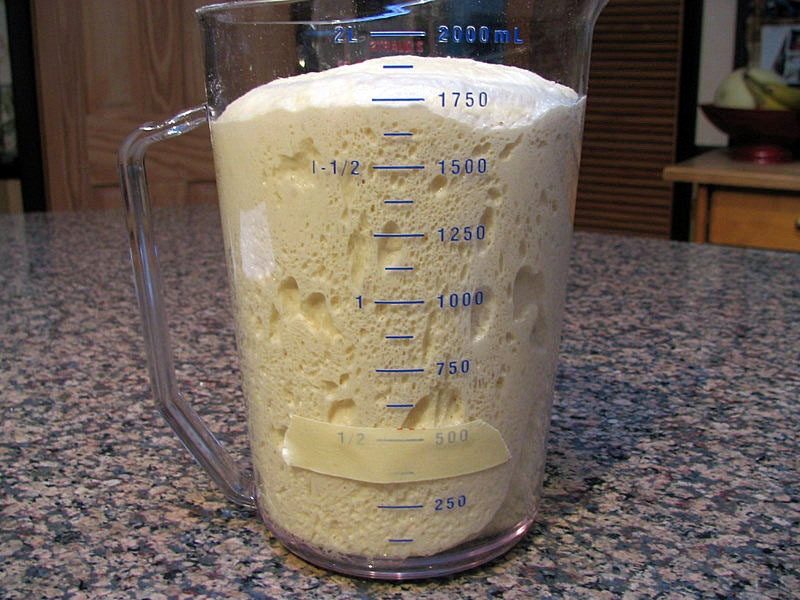 the dough is mixed alowed to rise then shaped and put right into the oven. it must be shaped gently as so not beat the h**l out of it and keep as much gas as posable in the bread. since it goes right into the oven with out any proof if you knock it flat or lose to much gas the crust might crack because of oven spring. if you can keep as much gas as you can their will be less spring and then less cracking. Next time, I believe I'll try docking the loaf (I do use a chopstick) and baking under a stainless steel bowl until the oven is turned down. I rounded up the loaf best I could as I transferred it from the mixing bowl to the container for fermenting. I was very gentle in final shaping, as instructed. However, I would think de-gassing the dough would decrease oven spring. (There are fewer bubbles to expand.) What am I missing? it is strange but i have seen and experenced over proofed rye fall almost flat when picked up and put on a peel. however when put into the oven with lots and lots of steam it springs back to full size and has a good crumb and crust. it could be because rye is very yeast friendly. other breads will just fall but rye has an amazing recovery ability. why i dont know but i have seen it many times. This is my 3rd week's recipe. I was very peased with the way they turned out and looked. I've never made bagels that looked this good before. Those put any bagels available out here to shame. As do David's. I love the color you got - both how dark they are and the evenness of the color. Any comments on chewiness and flavor? Thanks David! I tried to follow the instructions very carefully as I have had problems with making bagels in the past (they looked a bit shriveled). The color is partly due to the Malt Syrup in the boiling water and then baking. I used a baking stone. The may be a bit over done, but the color was nice. These were not all that chewy as I used bread flour instead of High Gluten flour. The crumb was not dense, really fairly light. Again this was probably due to the flour or it could be due to these not having any salt in the dough. 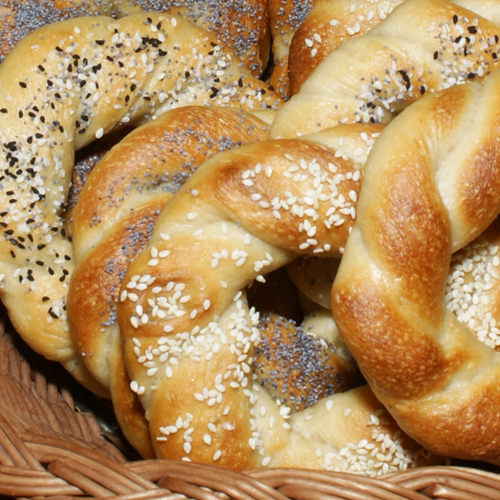 What type of flour did you use on your twisted bagels? They really looked nice. I used KAF Sir Lancelot. The bagels were very chewy. 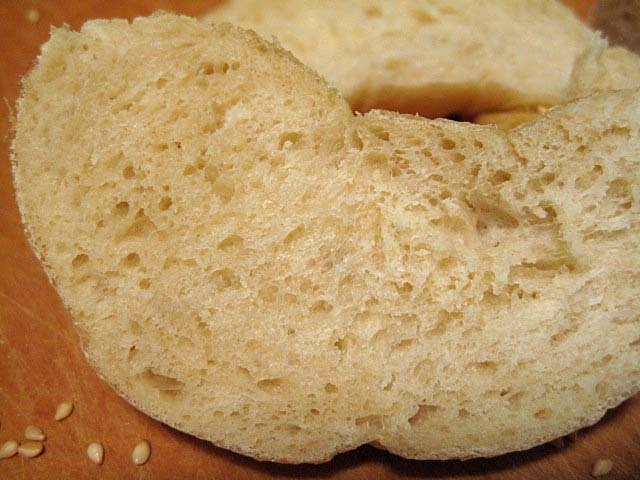 High gluten flour makes the best bagels ... when they are fresh. They do not freeze and reheat well, I'm sorry to discover. Because the MBs don't retard, they don't have anywhere near the autolyse time that traditional NY water bagels have. 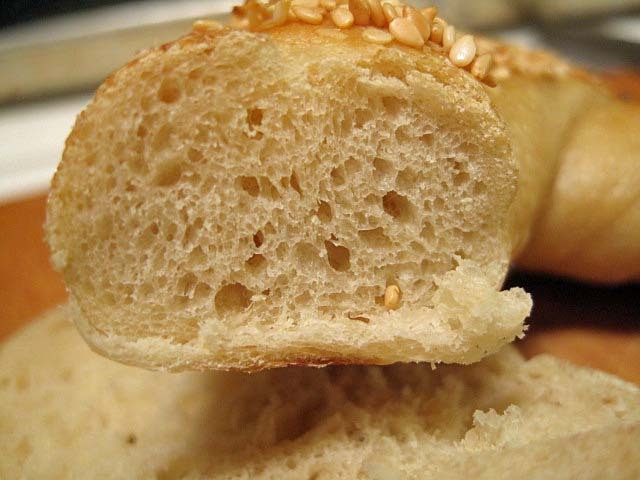 Therefore, you're not going to get close to the kind of gluten development (= chewy). Glad you guys are loving them ... so far, we're really pleased with how well these formulas are turning out ... thanks so much and keep up the good work! I'm definitely keeping this recipe. I'm going to make it for our family reunion this summer and blow everyone away. It's that good. Thanks, Norm and Stan! In these photos the crust looks burned, but it's not. 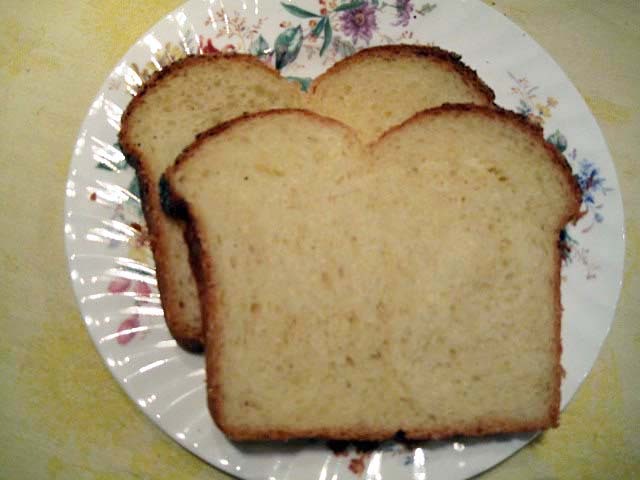 The loaves are dark brown, as per the instructions, but no black. It's tasty! I've been lurking and learning from all of you for quite a while. It's time to post a picture. To all of you for testing. I just wanted to take a minute to thank all of you for taking the time and materials to test these formulas. What we are doing is looking at all (and we do look at all of them) these feadback forms that were sent in to check our math (remember some of these formulas started with as much as 36 pounds of sugar) and to adjust the formulas for the home baker. Because of the great feadback we have adjusted some of the formulas and corrected some math mistakes that happened as the formulas were reduced to make them more practable for the average home kitchen. Your help will make this book something special Thank you all. 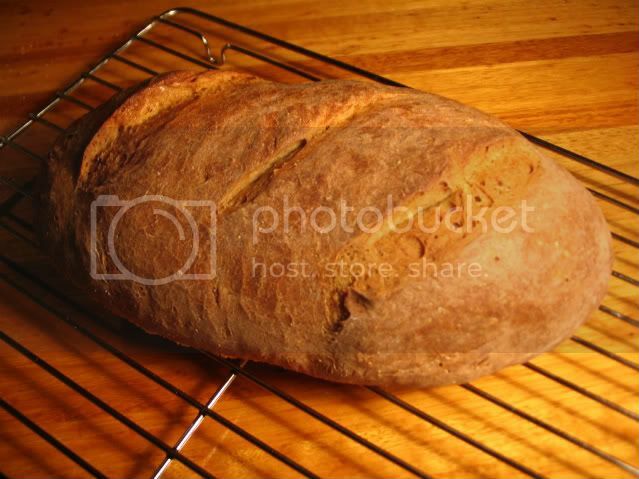 that's as beautiful a loaf as i've seen ... you guys are fantastic! can we use that image in the book? Its almost gone. Thick crust with lots of chew gave way to a moist dense crumb. Strong rye flavor. By accident we found out that it is FABULOUS grilled. The strong flavor holds up well and still shines through the flavor imparted by grilling. I am lucky enough to live near War Eagle Mill and had a supply of Course Rye. 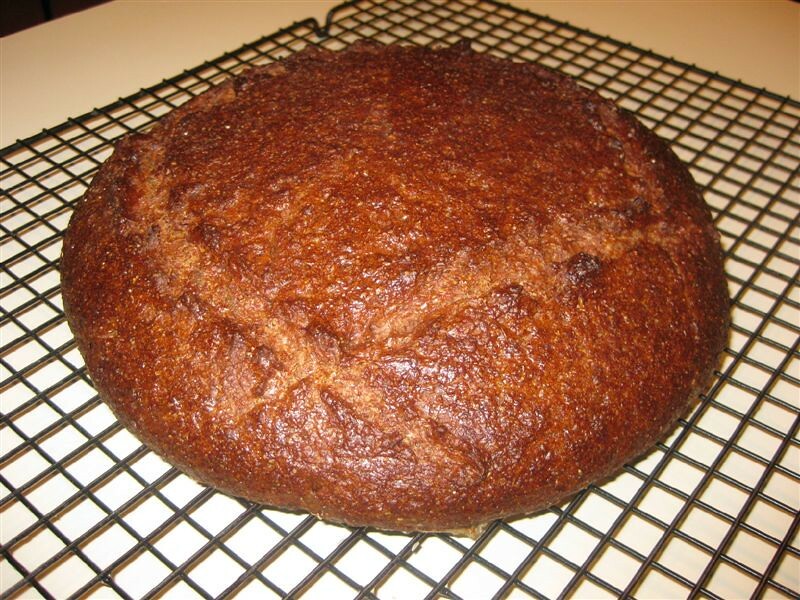 My local market had Bob's Red Mill Dark Rye flour. 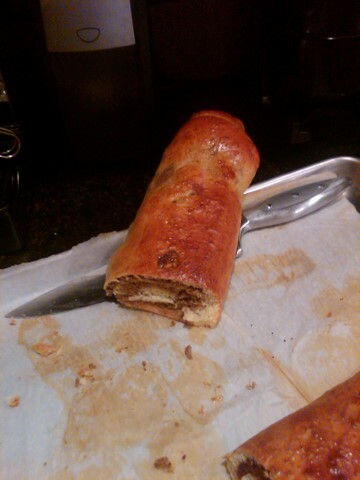 I doubled the recipe when I made the Plovnik and chose to shape it elongated since I didn't want gigantic slices. Since I didn't wrap the bread after cooling, I found it difficult to slice. At first I used a knife and it was too much of a workout. Then I switched to an electric knife and got really thin slices, but I thought I was overheating the knife. Today I went to the supermarket and had the bakery slice it in the machine. It's not as thin as I would like it, but it is absolutely delicious. I served it with smoked salmon, red onions and capers. My picture is posted above. in old time culture were never sliced. the were presented to the table whole and passed around to each dinner that tore off a hunk and then passed the bread to the next person. thats how the very old saying of breaking bread started and asking some one to shair your meal was done by asking the person to " come and break bread with us(me)" and was considered and accepted as a high honer. the most important guest or the head of the family was allowed to break the bread first. Now with the strong metals that our knives are made of bread is commenly sliced but some of the old time breads have such a strong crust they can make even the strongest of knifes cry out for mercy. A little sloppy but that doesn't detract from the taste. They are made with a cream cheese pastry.For some reason I can't rotate the picture but you get the idea. It's been enjoyable seeing what everyone is doing with Norm's recipes. I'm posting here just so I don't miss anything. I think posting at the end of the thread is just right, since yours is the first post on this particular recipe. I've never had a NY salt stick, but from what I've read (in Greenstein) and what I've found in California Jewish bakeries, yours are puffier and have fewer rotations than "standard." They were thinner and longer than a croissant, and had a gentle curve. The ones I've had were delicious when very fresh but staled very quickly. They taste really wonderful - husband gave two thumbs high up! I think your salt sticks look great ... just not exactly like the ones I've had. And, as we know, the proof of the salt stick is in the eating. I'm sure if your husband had 3 thumbs, they would merited "three thumbs high up." In context, the lesson is that the recipe authors may need to provide better shaping instructions and some photos or illustrations. if you were working for me as a baker i would have no problem with putting them in the roll case and i am sure they would sell so fast that there would be no stale rolls to make bread crumbs. Your salt sticks look great, Sally! And thanks for posting your pics. I'm having trouble visualising how the sticks should look going purely by the textual recipe description and am glad to now have some idea from your interpretation. They sure look yummy! I think in the recipe evaluation I will suggest a little more detail in the shaping, possibly with illustrations. Sally, my Salt Sticks came out like yours. The ones that are hollow were filled with nuked garlic in mash potatoes. Mini i make these yeasterday and yours look exactly like mine!!! 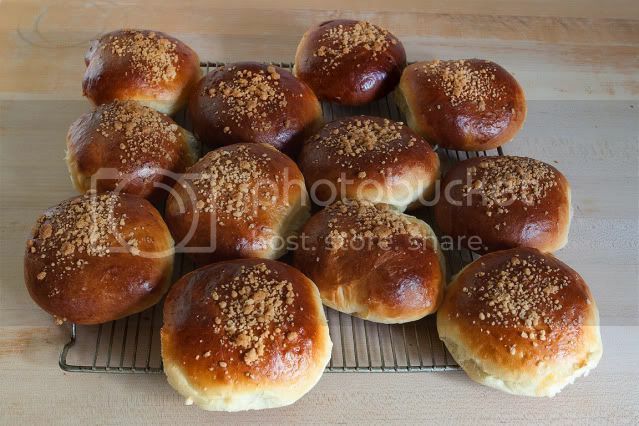 those look a lot closer to the salt sticks of the Jewish bakery than those Salzstaengerl from the link in Mini's post. the ones i grew up with were not truly "sticks" as much as sticks tapered on both ends, like yours, but perhaps a bit thinner in the middle. i think next time if you pull the point of the dough further out while you're rolling the stick you'll get closer to the real thing. still, Norm's comment is about the highest praise you can get and i heartily concur. VERY cold ambient temperatures where I am at the moment (max inside temp 14C/57F today). Far from getting the dramatic lift Sally's pic shows, I ended up having to extend the recommended bulk and final proof times. Pleased with the end result. Had these babies with a big bowl of peasanty spicy Italian sausage and vegetable soup for dinner tonight, accompanied by a nice shared bottle of Cab Shiraz. There are worse ways to compensate for a chill winter's night! You got my vote for good looks! Ok, Ross, ready to do the twist? ...ah'm ready, like I wasn't last summer! 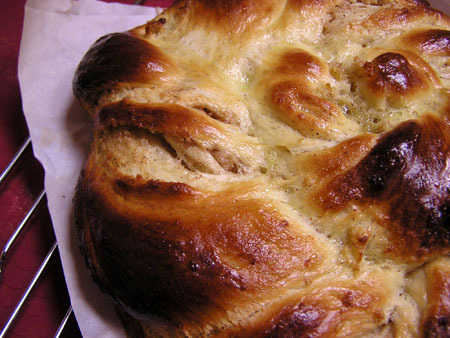 Never made challah - never even tasted it! If anyone could educate me on how it's usually eaten (accompaniments, at end of meal, beginning, as a snack etc), would be appreciative. Ta for your kind comments on my salt sticks, BTW. Of course, that ear was a result of imperfect shaping, but I'll take happy accidents like that whenever they come my way...! On to cookies now - I can taste the "sweet" life already. Good job on Egg Bagels! I made them also. They were very easy to make. They didn't have any chew though, kind of bready. What did you think? I think a longer turn in the malt bath would help improve the chew. Stan said on the Montreal bagels lack of retarding also effects this. 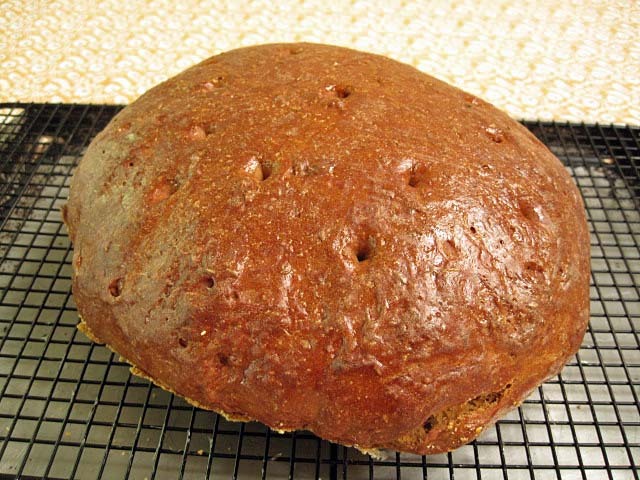 The rye was suppose to be "black rye" bread - it is "red rye" bread. My next recipe is the horseshoe cookies - 24 of them = 12 for me and 12 for my wife OR a more sensible strategy would be to share with some of my neighbors - I am a diabetic :-) (really no laughing matter, but it is getting late). is retarding in the fridge for tomorrow. Are you baking tomorrow? I'll be watching for your test results. These sweet rolls look like cinnamon rolls, don't they? I always want to like cinnamon rolls but generally find them boring except for being too sweet, which is annoying. These rolls are to die for (or from, if you have a cholesterol problem already). 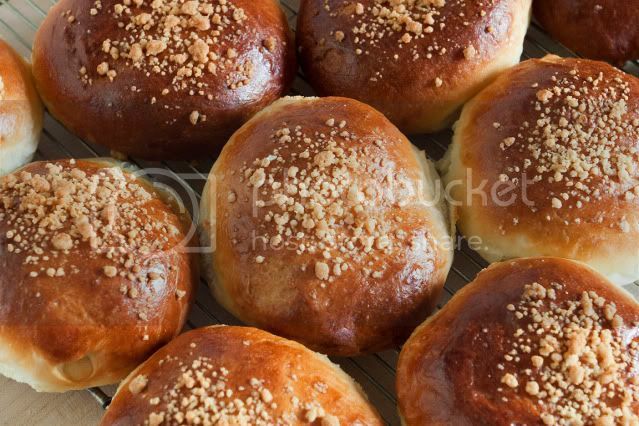 These rolls are not boring and are just the right sweetness, to my taste. My wife, who does not like very sweet stuff but loves pastry took seconds and said, "I could finish them." I want full credit for not tasting them until they were cooled and even getting a photo with all seven intact. I hope there are some left for breakfast. They look wonderful and I'm looking forward to finding out what makes them tick! 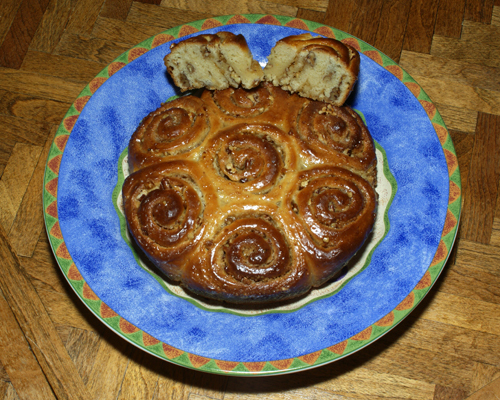 I love Sticky buns..to me like a Cinnamon bun with a caramely (sp?) glaze rather than cream cheese and sugar..which is too cloying for me. Need to raise your cholesterol some more..split them in half crosswise and make French toast with them. No syrup needed..just some more butter! 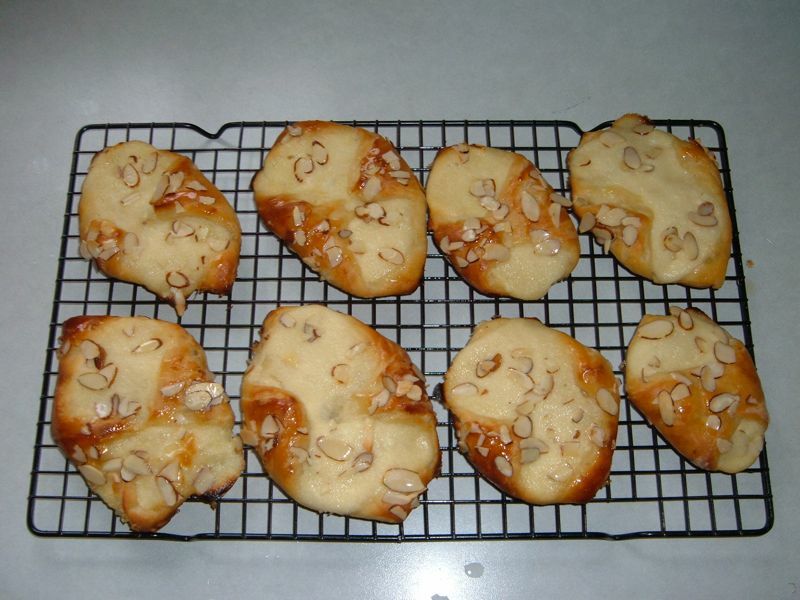 My assignment for this weekend is Horseshoes..an almond paste filled pastry. The dough is retarding overnight and I will share my luck, good or bad, tomorrow! ...and then there were none! Thanks for the visual goal for my own effort with the Seven Sisters. Which one of you was an Austrian Baker in a former life? 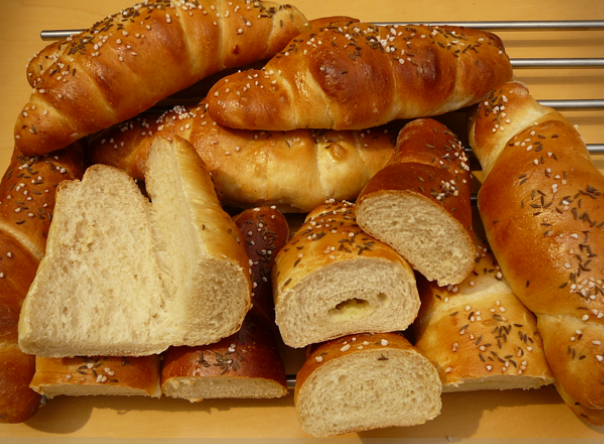 Having trouble uploading photos... all seems to be going well with Group A breads, though I was very disappointed with my Plovnik. The crumb seemed gummy and sour, even though I let it rest for the 2 full days. other 3 recipes were great... looking forward to horsehoes. I was not too surprized that my Plovnik did turn out so good - have not cut it yet since it still has another 24 hour to "stablize". Youe photo looks nice - sorry the crumb is gummy. I was curious - was your final dough very soft, wet and sticky? Yes - but I wouldn't call it "soft". Sticky & wet, yes - but very dense. Shaping didn't take much, because it just acted like a lump. I fear that I did something wrong in the sponge stage, because the sponge never doubled (thought it did get bubbly and fresh-sour smelling). Could also be that it just needed to bake longer than 2 hours. I expected a dense bread, but not like this. I think I'm also just used to a springy-er dough that has some elasticity - which may not be inherent to this bread. I made another Kornbroyt today to take with me on vacation. For this bake, I decreased the caraway seeds by 20% (personal taste) and docked the loaf, to see if I would get less bursting. 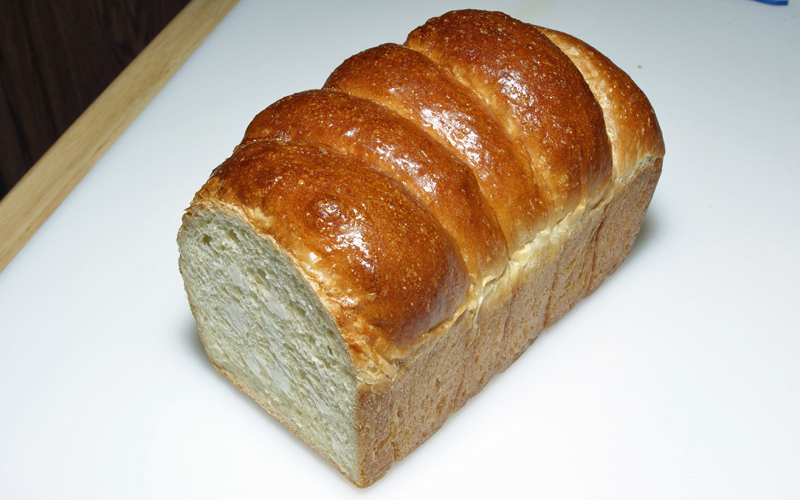 I also used a thicker cornstarch glaze, because I prefer a shinier loaf than I got with the one recommended. 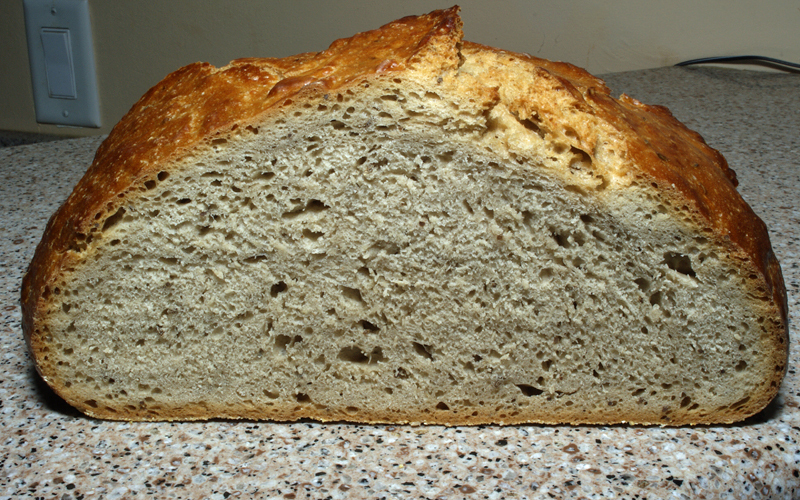 Well, I still got some bursting at the juncture of the side and bottom of the loaf - two small areas 180º apart. I'm not sure how much of the decrease can be credited to the docking. In any event, I'm happy with the result. I think my family will be too. 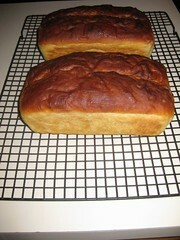 I also used a thicker glaze, for the same reason, on my test loaf. I'm baking a couple loaves of this bread in six weeks as 'thank you' bread for folks putting us up as we travel north for a couple of weeks. I think it will be well received. I think this is a good choice for traveling. It should keep fresh (and improve in flavor) for a few days. I'm not really sure what Horseshoes are supposed to look like, but probably not like these. 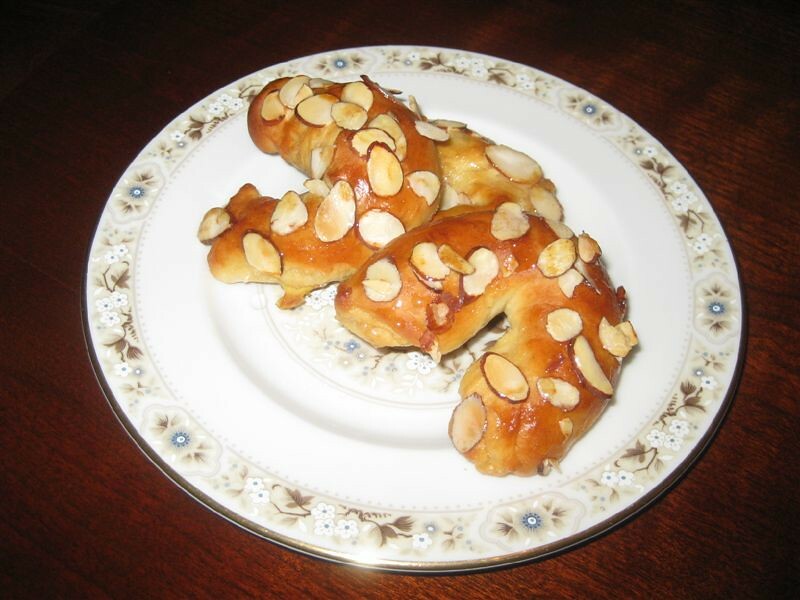 I think they deserve a more genteel name..Almond Twists or Almond Commas LOL! 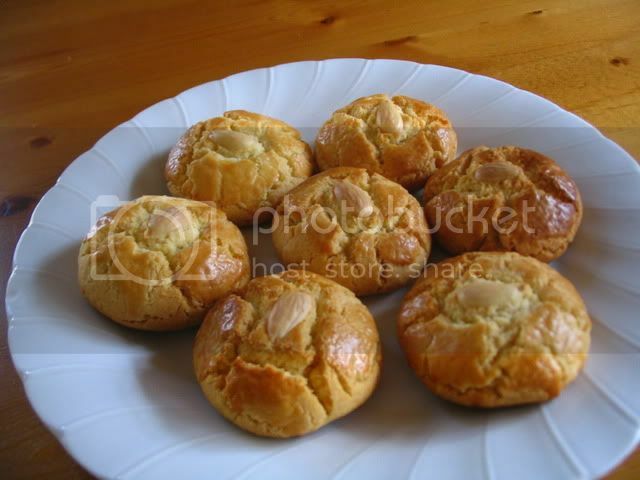 Slightly sweet, faintly almond and would be wonderful with your coffee or tea. I don't know what they "are supposed to look like" either, but yours sure look good. They sound like something I'd like, from your description. 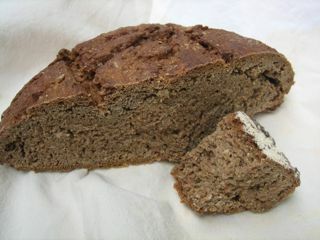 I made Mild Deli Rye for this weeks recipe test and it turned out very nice. This 4 weeks in group A has been a kick and I am looking forward to the next 2 categories. Sorry, the crumb shot is a bit out of focus. 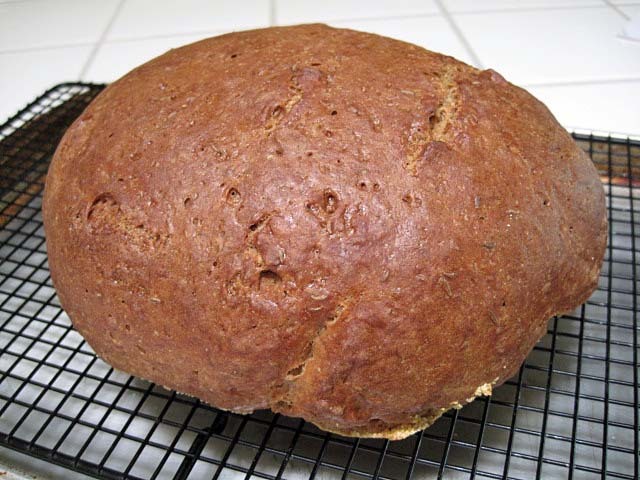 Mild or Light Deli Rye is my most favorite rye bread. Your's look fantastic. Thanks, I did not put caraway in as I could not find it in our spices so maybe next time. The texture and flavor were very nice. I think I associate Rye with Caraway too much. Sometime I'll delve into rye breads more. I baked them twice, in serial, learning a lot from the first baking. 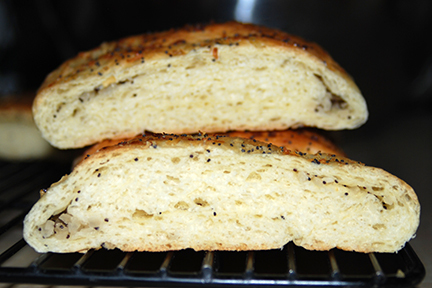 The exposed crumb is from the first baking. The crumb is more cake-like, than traditional cinnamon rolls or sticky buns, but that might be due to a technical mistake I made mixing the dough. Flavor-wise I can't add much to David's comments, except to say this recipe is layers on layers of flavor. It looks like you got much more expansion of the rolls than I did. I really think the yeast made a big difference. 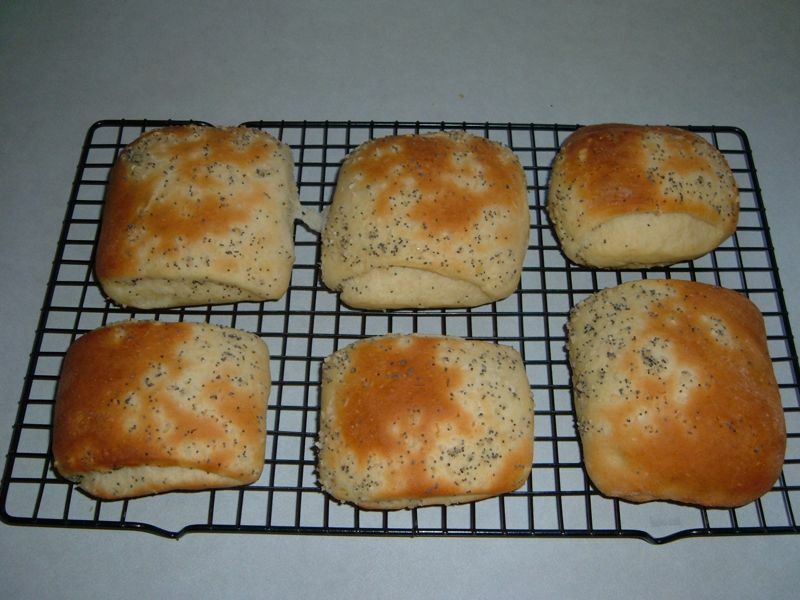 Were the rolls expanded during proofing, or did the merging occur with oven spring? but, subjectively, more occurred from oven spring than final proofing. Horseshoe cookies are a much BIGGER hit with the family than Plavnik - go figure - what is this world coming to. Your's look a whole lot better than mine!!!! 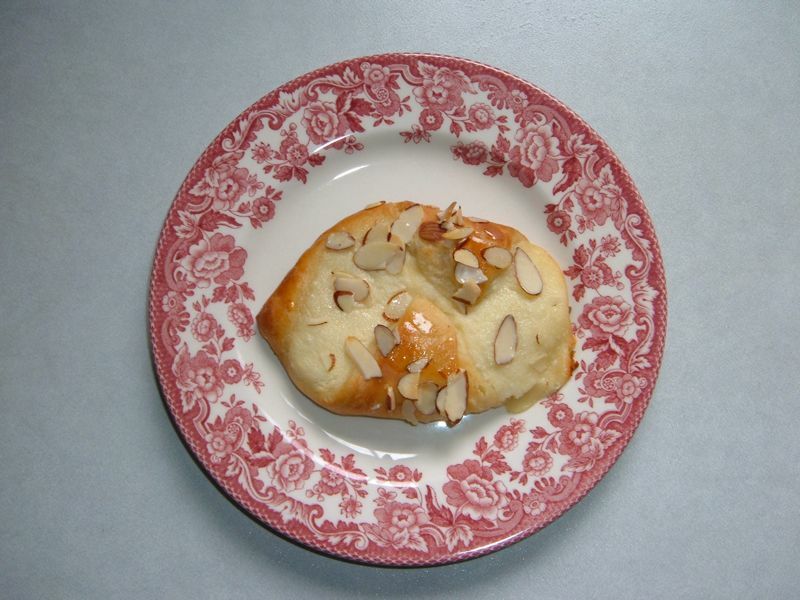 This was a fun and interesting recipe, and as I was unable to find "Almond Paste" locally, I made my own. Slivered and toasted the remainder for the top. I'm sure made all the difference in the world! Very nice Horseshoes! I had a heck of a time shaping them, the gluten needed to rest! I probably should have let the logs rest between each stage of rolling them out. "Now, those aren't just lunch" (inside joke) - your horseshoes are extremely nice and I am sure just as delicious! Thank you for your kind words, These were delicious, but I thought them overly fussy and complicated, and if I hadn't had such fine examples to go by, I am not sure how they would have came out. 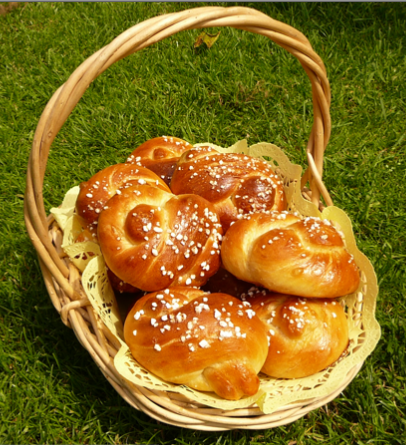 If anyone gets the schnecken, they take a bit more work but are definitely worth it! isn't it suposed to be inverted, so that the smooth side stays up??????? I'll be happy if mine work out nearly as well! Still struggling to catch up after the delays and email confusion...hopefully will manage to do these before the weekend. Anyway, always good to have some pics like yours as an example, although you've got the bar raised pretty high! I'm not sure I understood those directions either, but your twists look awesome to me! Are they dinner roll or sandwich size? Hard to tell..
Challah Twists for the Scrabble Party! I got called to Scrabble while these were in the making. We had them with real English Lemon Curd! I'm showing them because I sprinkled them with a special sugar (hagelzucker) which helps identify them as a sweet tasting bread. (Snow = Alps!) They were a hit! and comparison photos below with the dough rope "twisted" and "straight"
Makes for two different "looks"
Those look delicious, Mini! What a great summer time treat, especially together with lemon curd. Yum! Simply ausgezeichnet. 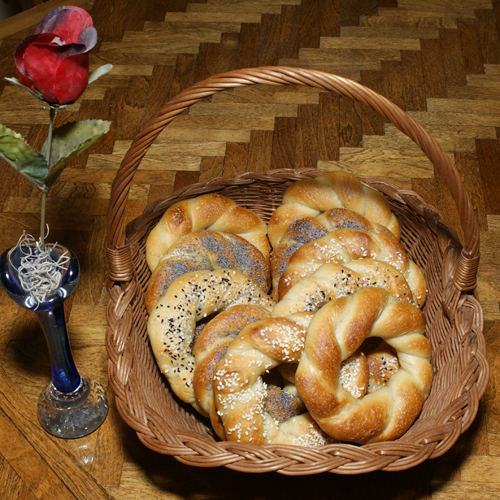 Finally...my take on the individual challah twists. I say 'my take' because I couldn't for the life of me decipher the shaping instructions (and I'm a pro copy-editor of 20 years standing!). 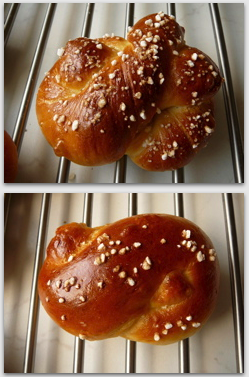 Anyway, recalling Mini's reference to Hamelman I consulted 'Bread' on braiding and went with his figure 8s. As can be seen from the pics, the rise took out a lot of the 8s, but no matter - they looked sorta cute, if flawed (you know what they say about mothers and their babies...well, suspect it's the same with dough dads!). This was my first time making Danish and I think that these turned out pretty well despite the many mistakes that I made. I will make this again! Funny. Mine looked exactly like those. And I mean exactly. I could not believe how delicious they were. My camera broke, so I am not able to post pics. Looking forward to seeing what Stan and Norm have in store for this week. Your take of the cake looks great. What size pan did you use? I thought it called for a 9" tube or 13x9. That looks more like a 9x9? I ended up using a bundt pan, so I lost the effect of the apples on the top. I bet this would be good used as the cake part of a strawberry shortcake since it is not overly sweet. Boy, I love adding the calories! Luckily, most of this went home with my daughter, son-in-law and grand-daughter. It is an optical illusion - I used a 9X13 as instructed. I would have had too much batter and apples for anything smaller. I apologize for the photo quality - these photos are the result of a blind man who loves to bake using a Logitech PC camera intended for Skype use because his lovely wife went to visit her Mom and took our real camera. All this does not change the calories in this desert one bit. Thanks for the Thread David! I am so glad to see this thread - I was wondering how all the rest of the test bakers are doing. I don't have time to read all the comments now as I'm headed out of town shortly but will definitely come back when I'm home on Sunday and go through them one by one. I'm not sure which group I'm in - I think it's group C but Poppy Horns were my week 5 recipe. 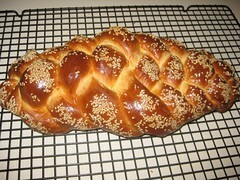 I've also competed the challah twists which I will post when I'm back from my trip. The poppy horn dough was wonderul to work with. 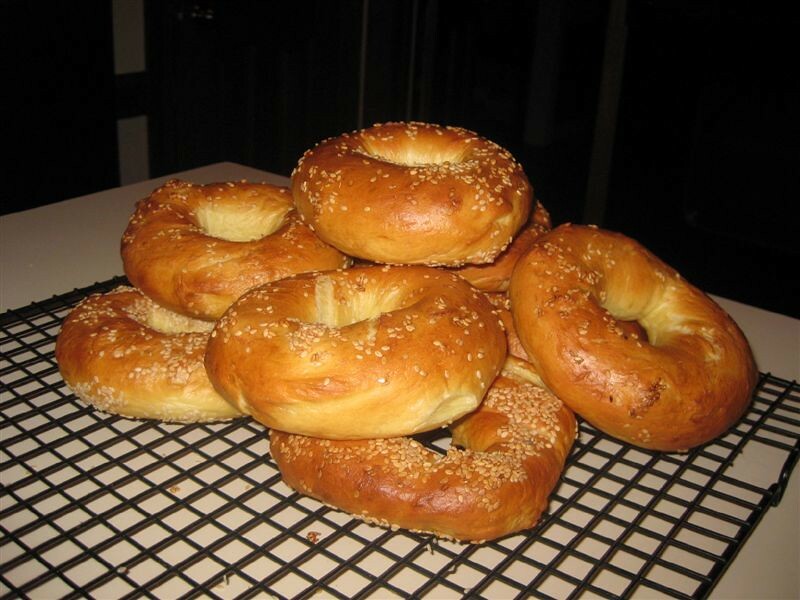 I had the powedered malt on hand for making bagels and so added it to the recipe. The flavor and texture are wonderful and we will defininely be making these again! I've been on a quest to find a recipe for Poppy Horns for a long time. You did a beautiful job with yours, how I wish I had the recipe...NOW :0)...but I know I have to wait till the book comes out. Thanks! was really pleased with how these turned out - it was the first time I had made anything like this. I will be making these again. These cookies put my pathetic piping skills and equipment (Ziploc bag with the tip cut off) through their paces. Wildly uneven cookie sizes and really poor piping skills do not do these cookies justice. They are delicious, though -- don't let their kindergarten looks fool you. However, the flavor of the cookie is not assertive enough to overcome poor jam, so I'd definitely use a really outstanding jam or filling for these. 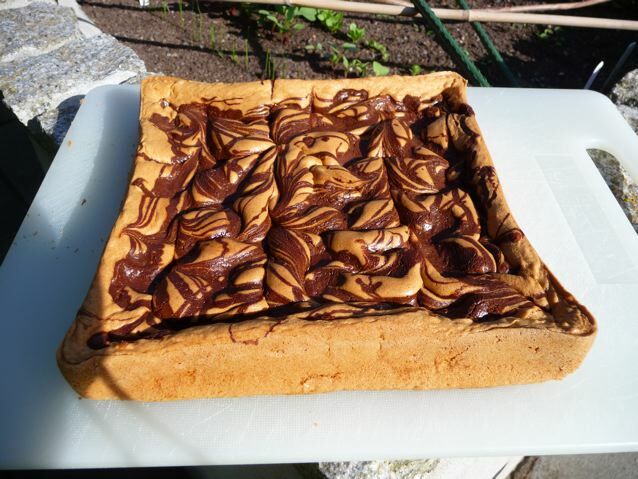 Oh, and skip the Nutella as filling. Overly sweet without enough flavor. 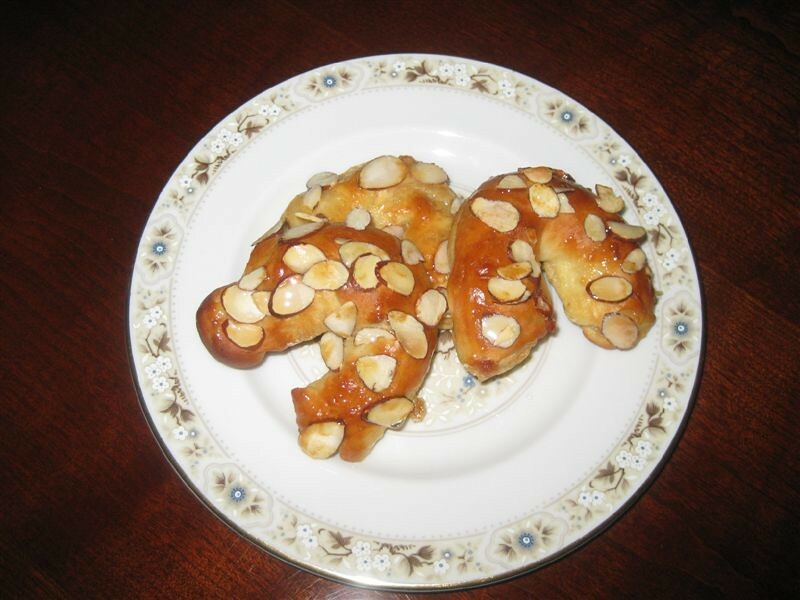 I used homemade apricot and wow, they're great, delicate and light. I think their "looks" gives them their charm! Is it too late to sign on with the NYBakers/Norm's Book Recipe - Tests ? I'm off from teaching during the summer and would love to take part. I've been baking for years at home. I use to work part time at a local pastry shop decorating specialty cakes. ya never know. We started about 7 weeks ago. You can TFL message Elagins and ask. The Corn Rye was the best Jewish rye bread I've ever tasted. I've never had any from NYC, though. I'm afraid the deadline for sign-ups was prior to the first post in this thread. 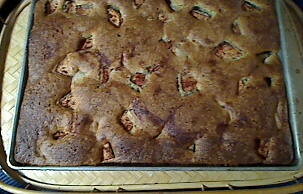 Just to let everyone know that I will not be posting photos of my Apple Cake. It is wonderful to see all the fabulous photos posted on here but we all know that sometimes even experienced bakers make mistakes. My oven has a small switch that turns the top element on. It is for use with the broiler setting on the oven. If this switch is set to "ON" when baking ONLY the top element works. I never use this setting so I didn't notice that it had been switched to ON (probably when I was cleaning up). The end result was my Apple Cake was burnt on top, and gummy on bottom. We carved off the char and tasted it and it was delish but the ducks got the rest. P.S. I didn't notice the broiler switch until I had almost burnt my chocolate roll. Lets hope I caught it before it was too late. will post pics tomorrow. Haven't tasted ours yet. Loved the butter cream, the cake smelled awesome. Found the final chocolate glaze needed to be thinner. See what you think, but by my trial I would try 2 tsp oil. See what you think after 1.
the trick is to not stop keep adding hot water (slowly in small amounts you can add more but you can never take it out) untill the choco becomes smooth again and pourable like thick whiping cream doubble cream if you are on the other side of the water. pour this over the chocolet roll checker board cake or seven layer or layer cake what have you. play with it you can add sugar if you want it sweeter or even a little sweet butter for taste. I'll give it a try but..
this is certainly different than the instructions that came with the Chocolate Roll recipe we tested. Which one is going to be in the book? The roll is awesome, by the way!! 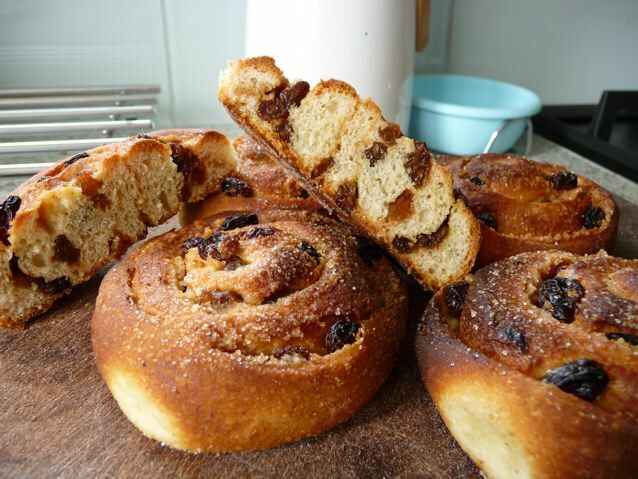 Here is my version of the babka and a pic of some little sultana buns made with the babka dough and ground up cake crumbs from another test cake (I listened to that lesson Stan!) that I froze for a couple of weeks wrapped in clingfilm, took out on Friday night, forgot about in the fridge tilll Sunday night. 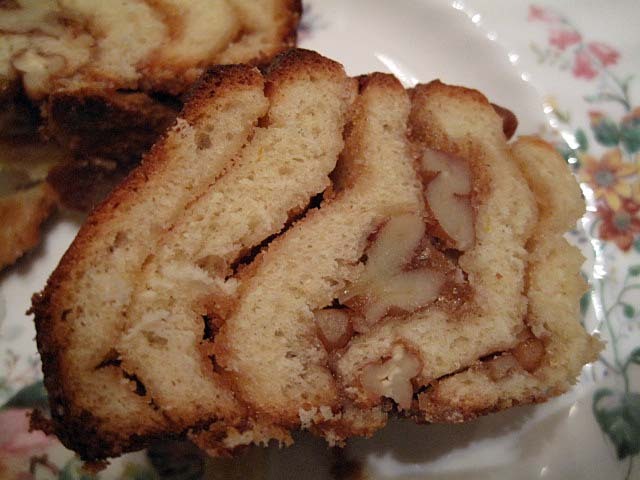 That Babka, OH!! so glad it resides in your house!! 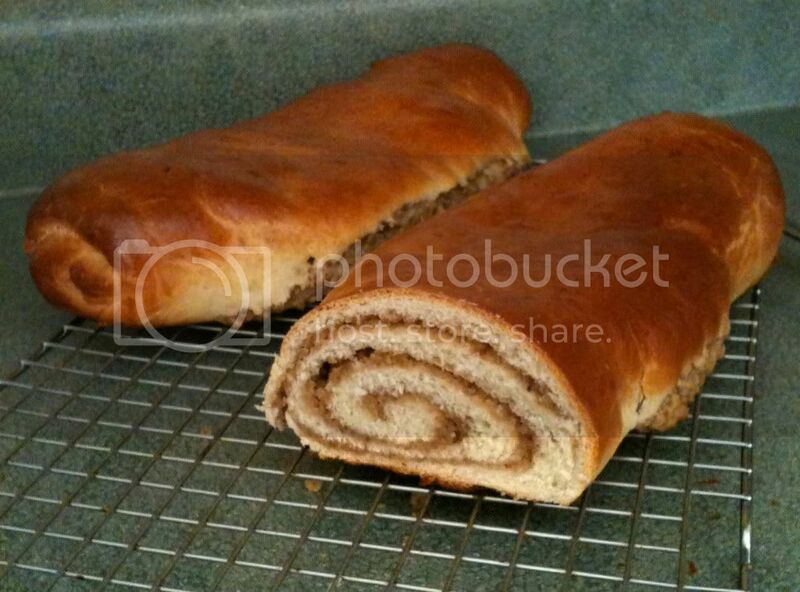 Your rolls look wonderful, but that Babka would be my undoing, WOW! 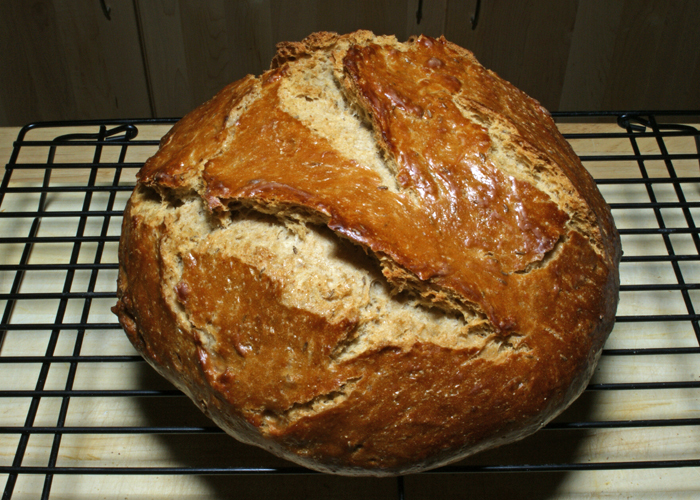 aside from the errant cornmeal wandering up the side, that's an absolutely beautiful loaf. your glaze is magnificent! Didn't get the nice shine you did with your glazing, Sally (think I overdid the glaze, despite the recipe caution on this). I also had to increase the baking time...and my proofs ended up being far longer than the recipe recommended. But that is due to the lowish ambient temperatures here at the moment, I suspect. This was a good tasting bread, I found. Had some last night with a mushroom risotto, and although I imagine that's not a usual context for this bread, it went well. 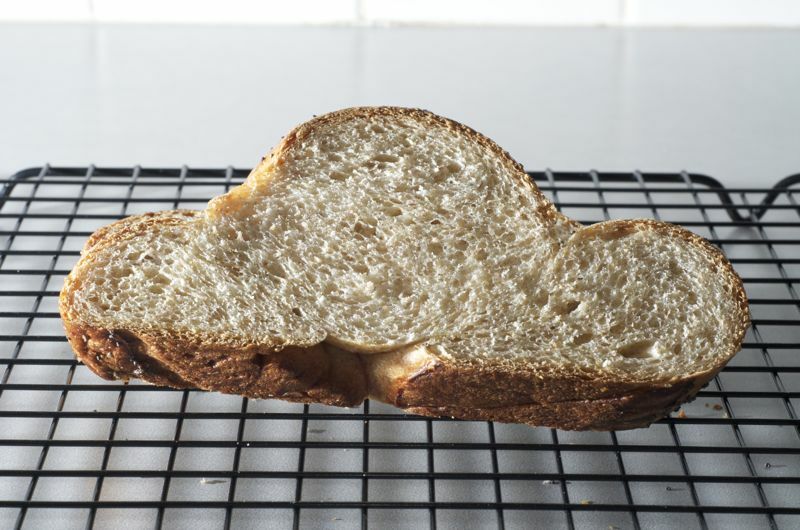 is to apply it as soon as the loaf comes out of the oven; otherwise, if the crust cools too much (and a little is too much), you'll get the cloudy, dull finish you ended up with. take the loaves out one at a time, glazing each immediately. i think you'll see an improvement. The loaves are in the oven and the glaze was so thick I couldn't spread it if I wanted to, let alone brush it on. I took about 1/3 of the goop and added about 3x the amount of water until I could nicely coat the back of my hand with the brush. Looks like I'll be wall papering in the next few days or making paper creations. Suggestion: use less starch. ...but nope, that wasn't it in my case. 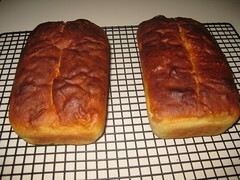 I did as the recipe instructed and applied the glaze AS SOON as I took the bread from the oven. I only made one loaf, so there was no waiting time at all. I can only think that I put too much glaze on, although I was aware of the cautioning against that in the recipe, also. Have never glazed bread before, so was probably heavy-handed and lacking a deft touch, despite my efforts to coat the crust lightly. I suspect Mini's large brush idea is a good one. Mine was a pretty small pastry brush. Fantastic Job! Great proportion of dough to filling. The labor of love finds me doubling the recipe often, so I freeze extra babka's. I wrap in plastic - wrapped in paper towel then placed in second plastic bag. Paper keeps any warm air out (opening & closing door )& subsequent frezzer frost and burn. Especially with the large amount of moisture in the filling. Defrosts superbly. It is so hard to look at the bakes weekly & not be able to try them.... Please hurry with the book!!!!!!!!!!!!!!!! !